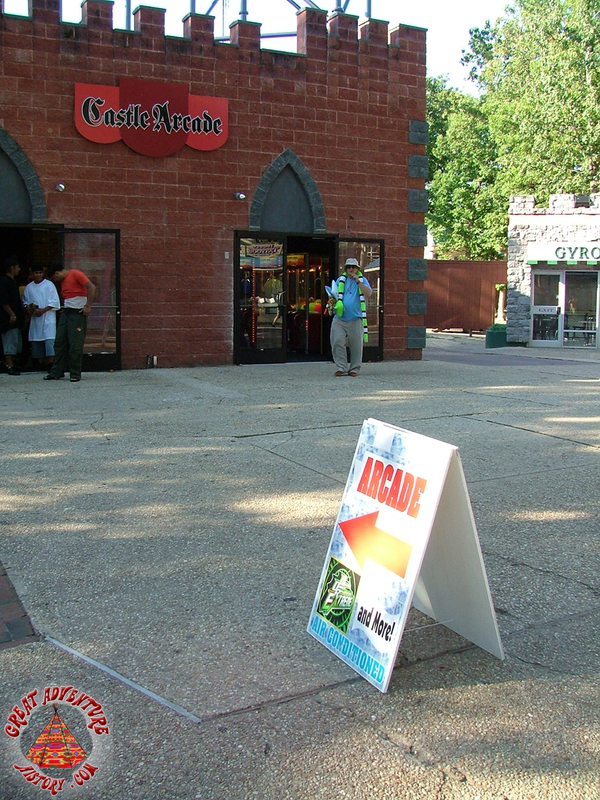 The early 1980's were the time of "Pac-Man Fever" as arcade games became a huge business, and theme parks added more video games as a new source of revenue. 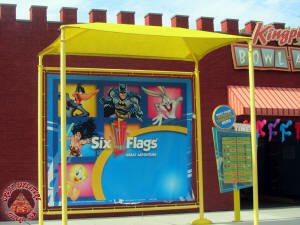 Video game manufacturer Bally even went into the theme park business, purchasing the Six Flags theme park chain. 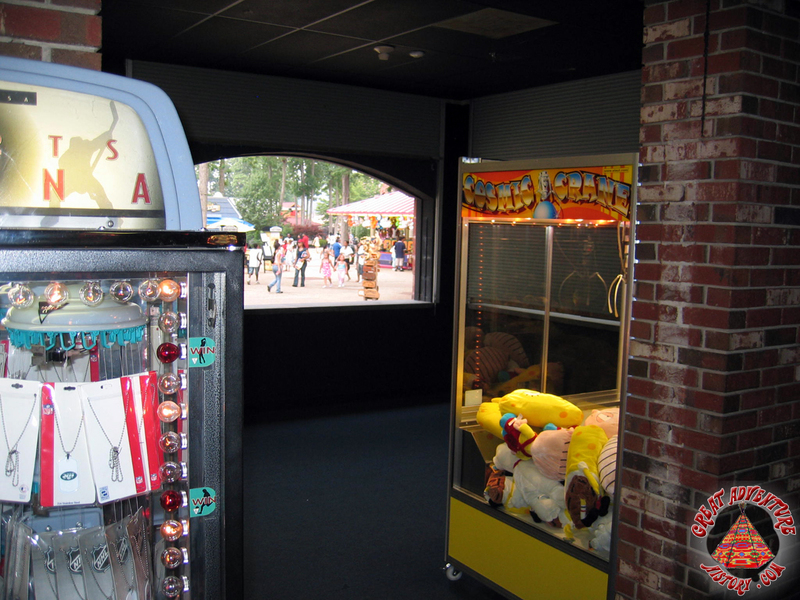 Parks scrambled to add arcades, with many adding new buildings just to house the expensive machines in more substantial structures that could protect their investments as well as have adequate air conditioning to handle all the heat generated by the machines and the guests playing them. 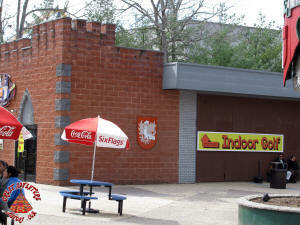 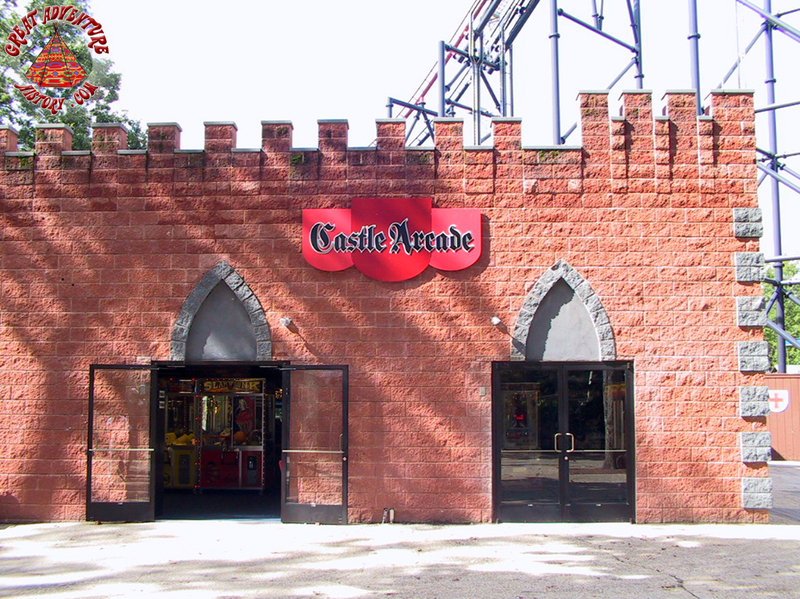 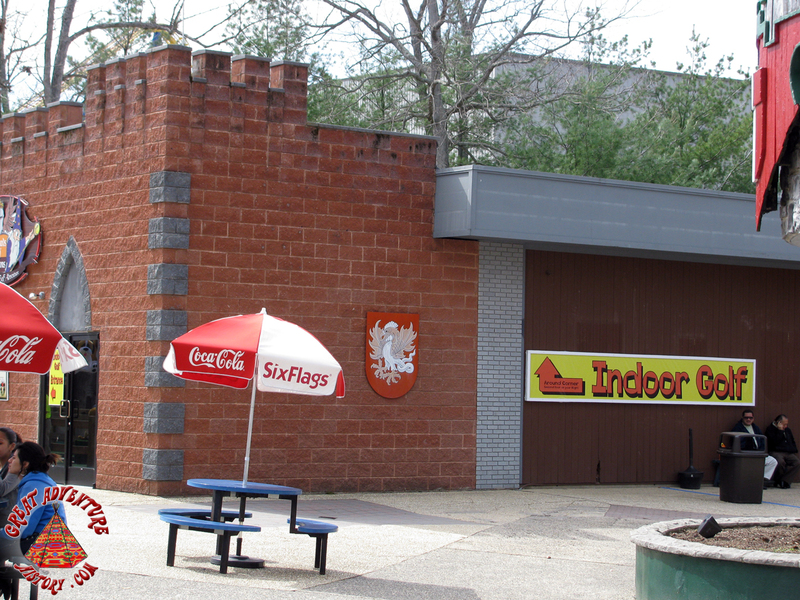 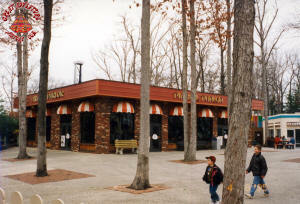 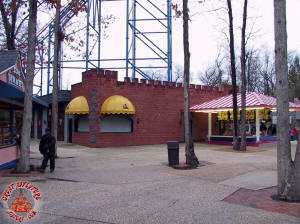 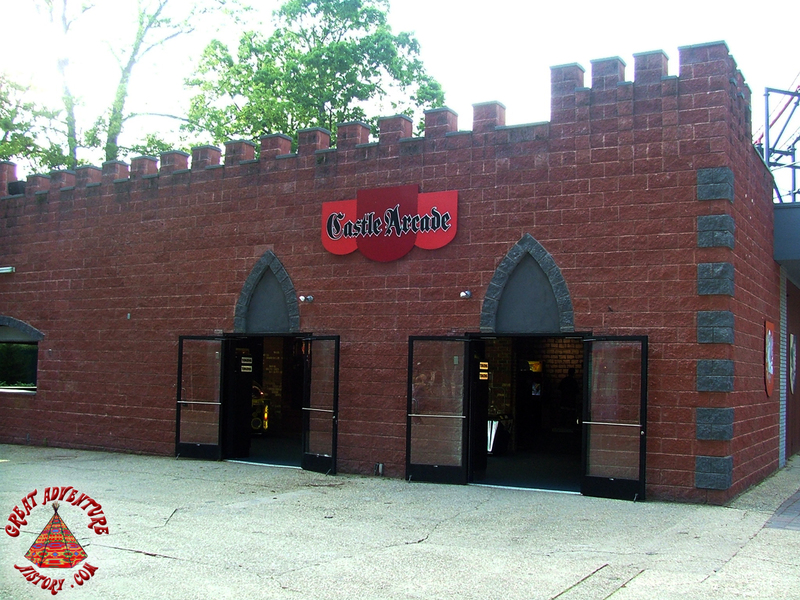 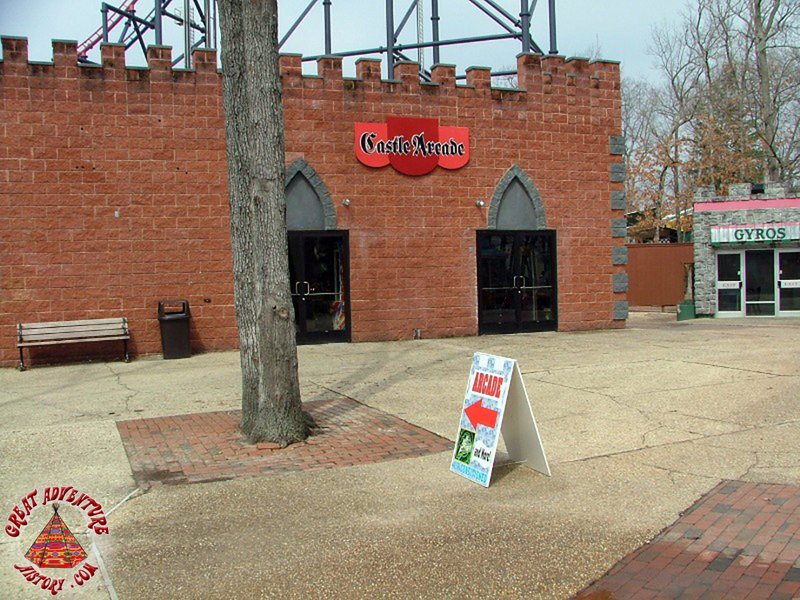 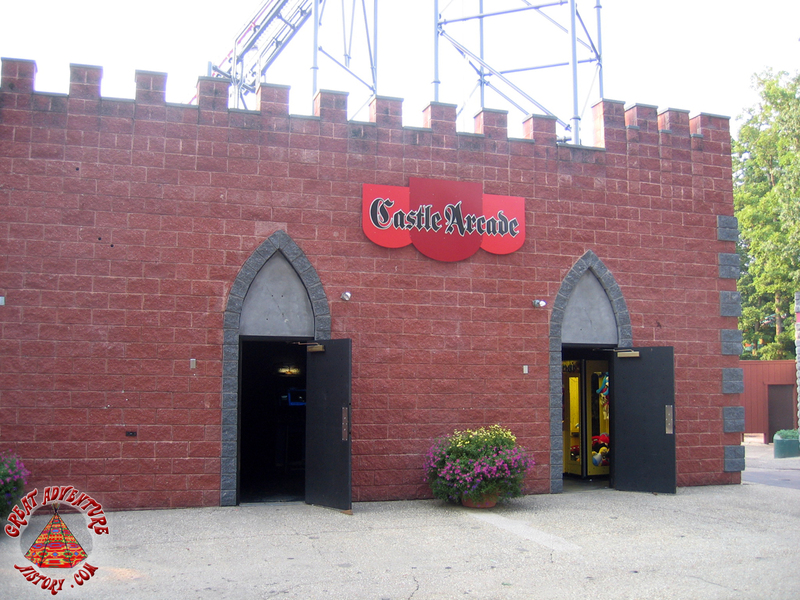 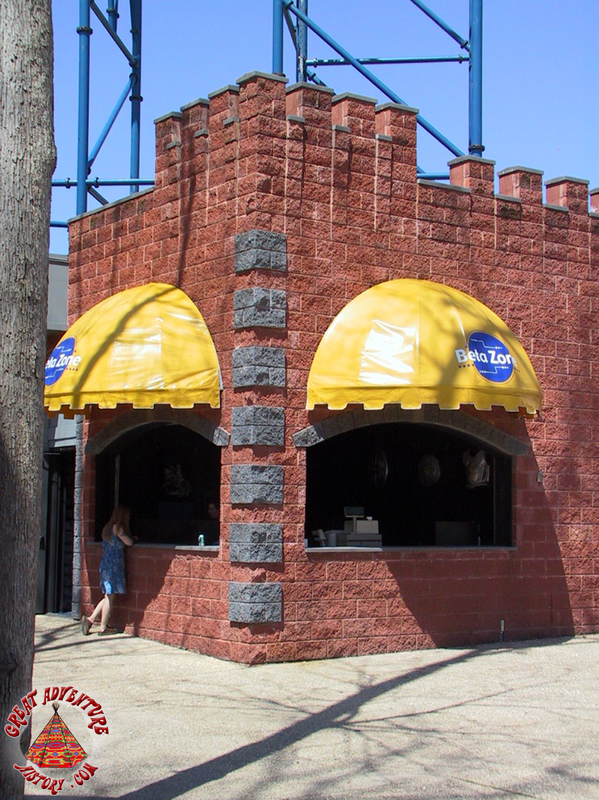 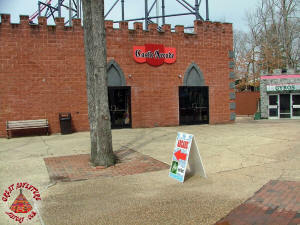 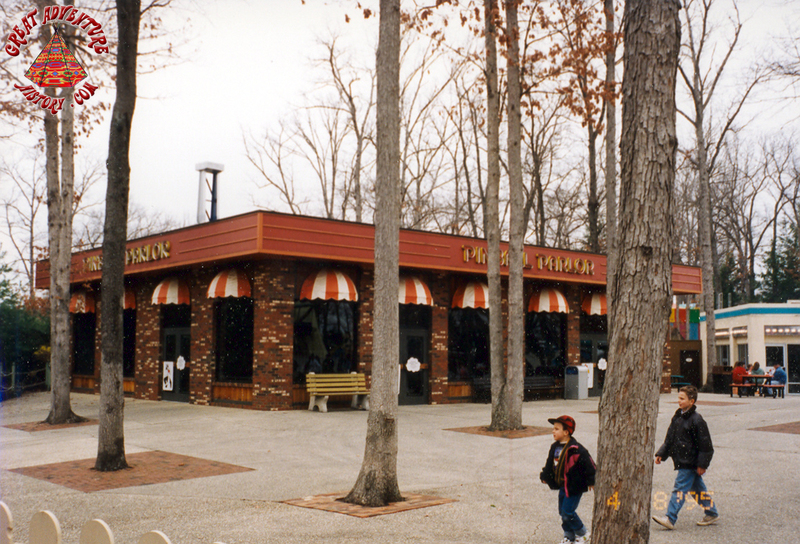 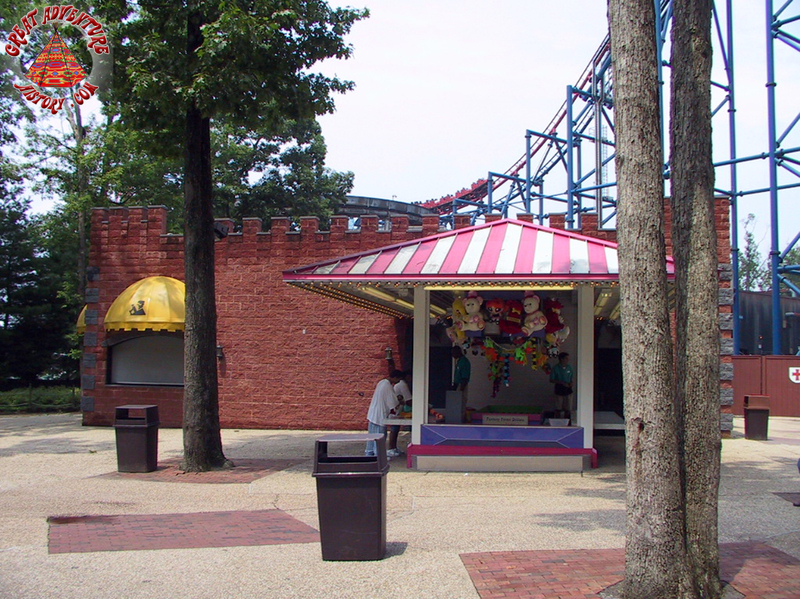 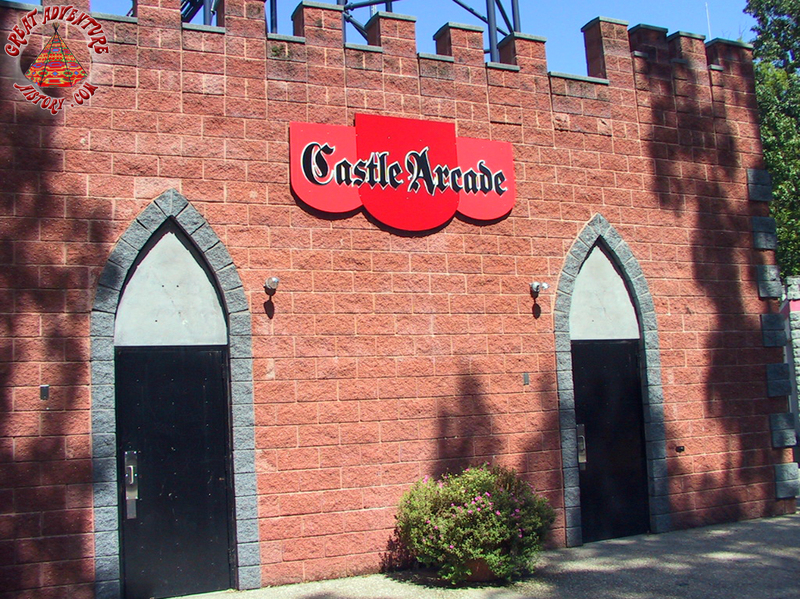 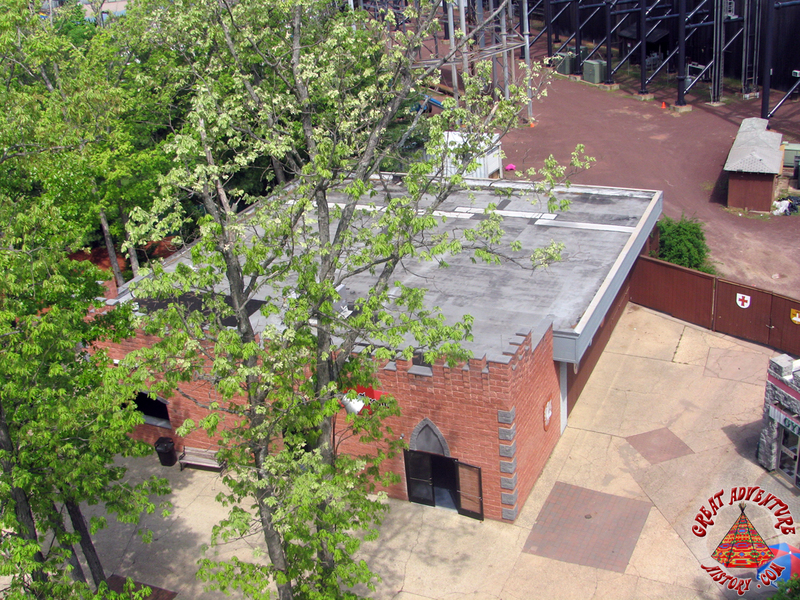 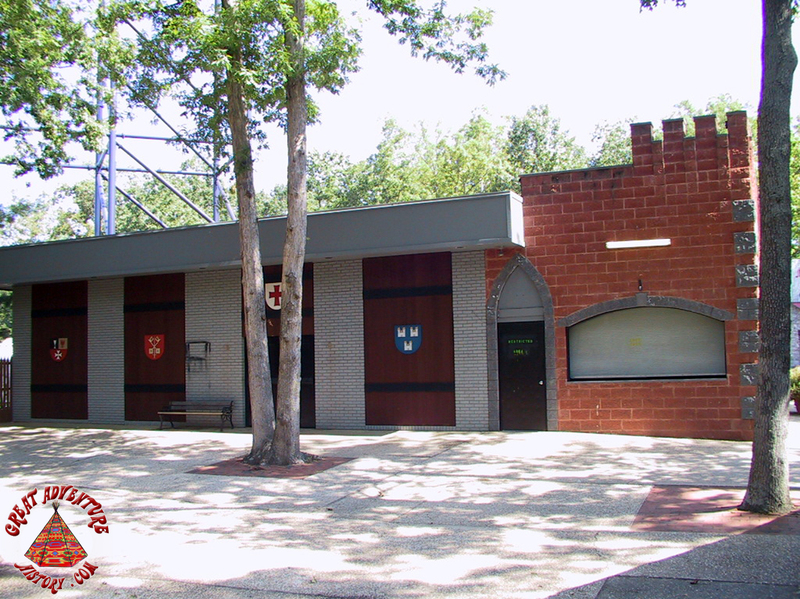 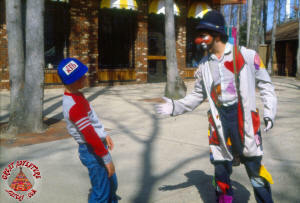 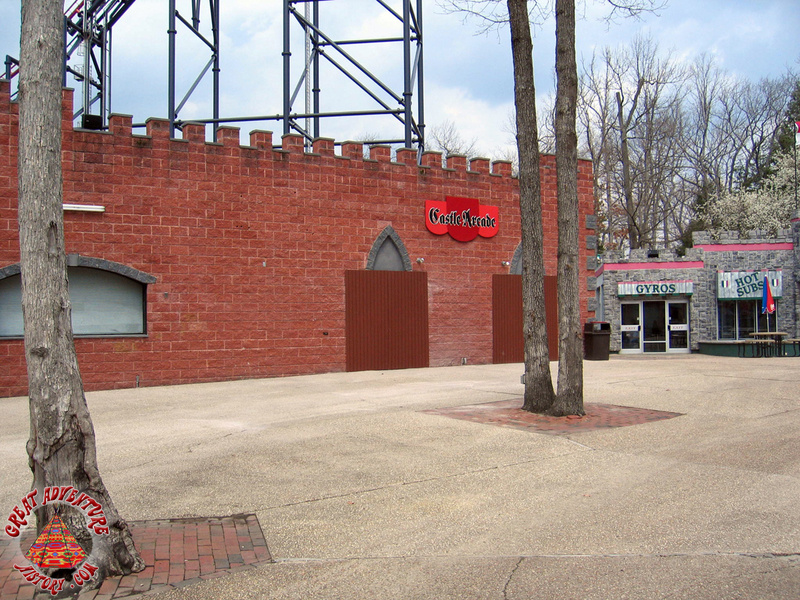 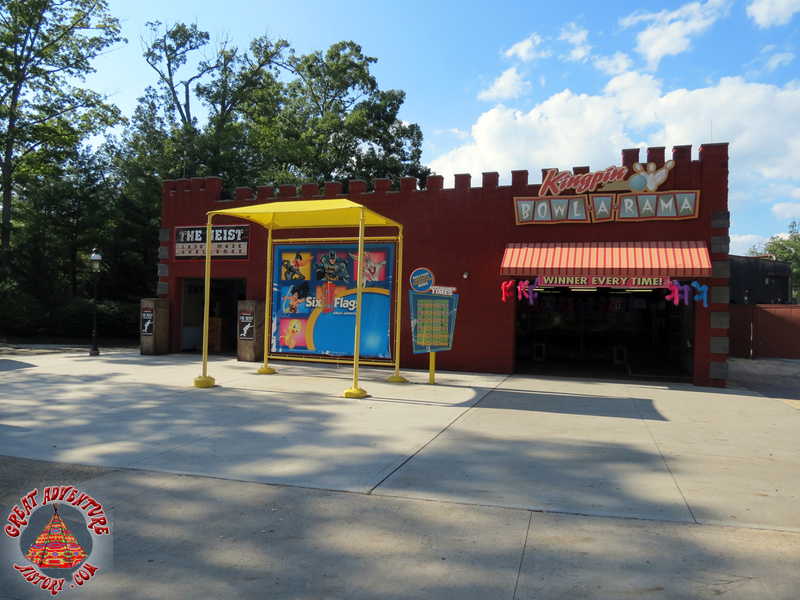 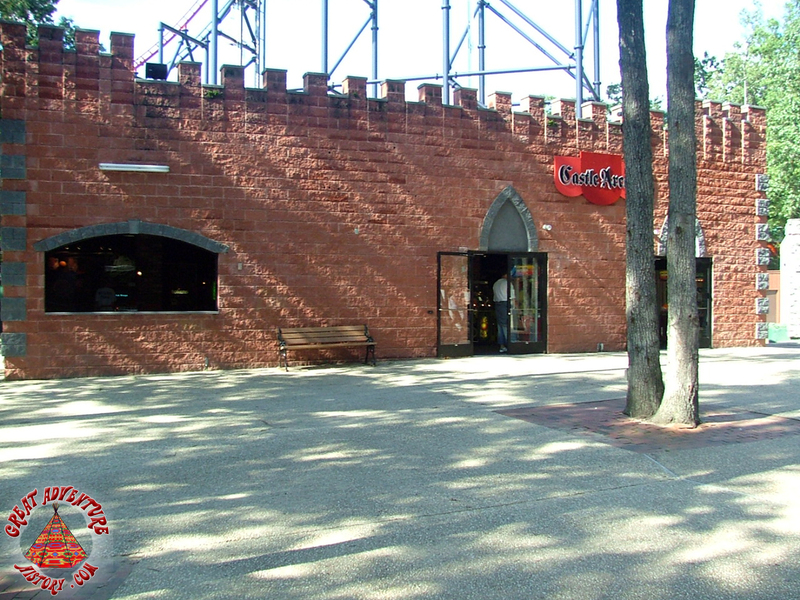 For the 1982 season, Six Flags Great Adventure added two new arcades to replace an arcade which was lost when the Fortune Festival games area was destroyed by a fire in December of 1981. 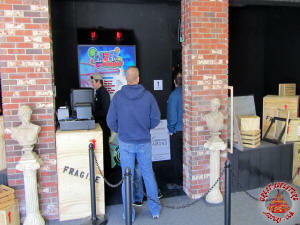 Dream Street Arcade opened in what had been the Import Bazaar in one of the "Four Tents", and at the other end of Dream Street the new Pinball Parlor was constructed near the Big Wheel. 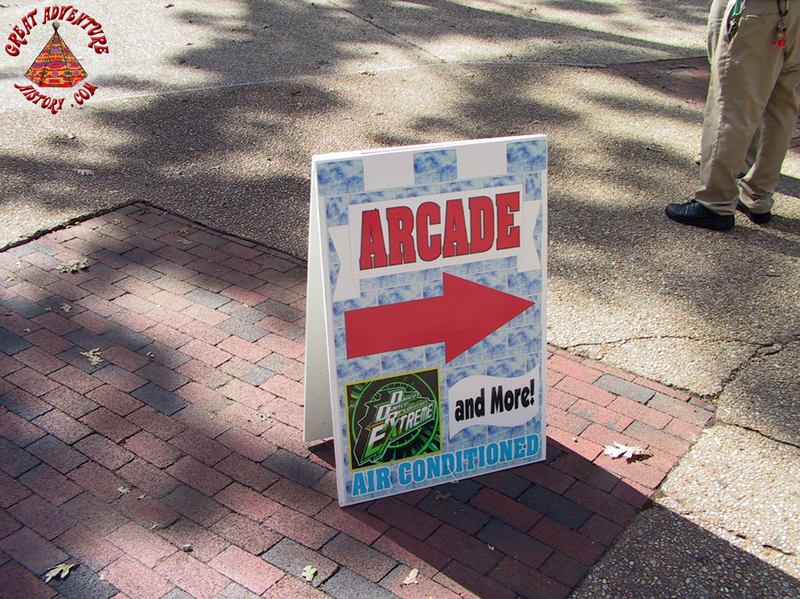 The two new arcades were a huge improvement over the old, hot and crowded arcade that had been in Fortune Festival. 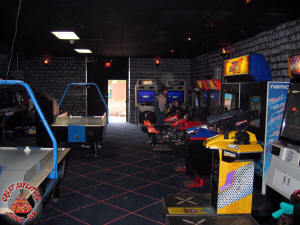 Initially, the Pinball Parlor opened with a large array of pinball machines and a smaller collection of video games, while the Dream Street Arcade primarily featured video games. 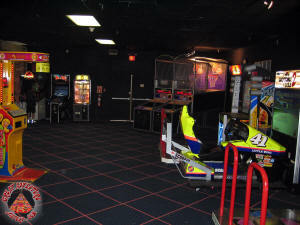 As arcade games continued increasing in popularity, the pinball machines slowly disappeared and more arcade games were added to the Pinball Parlor. 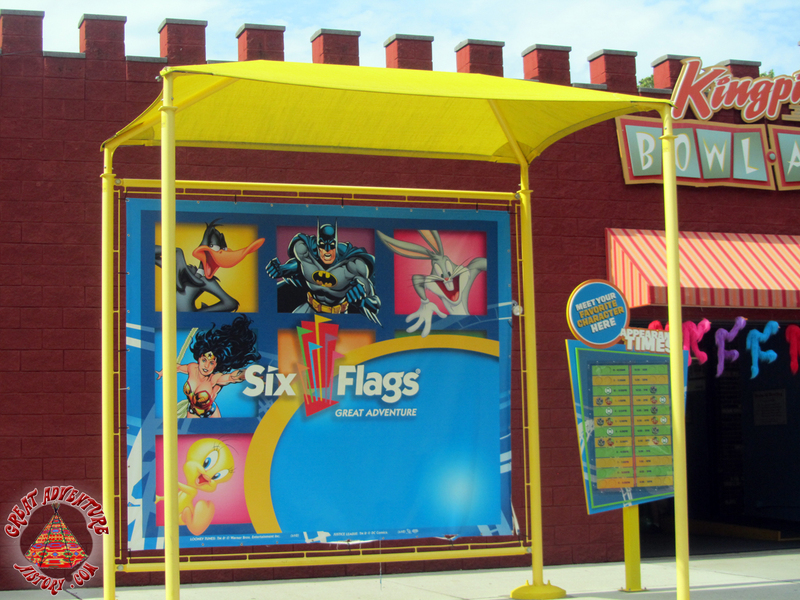 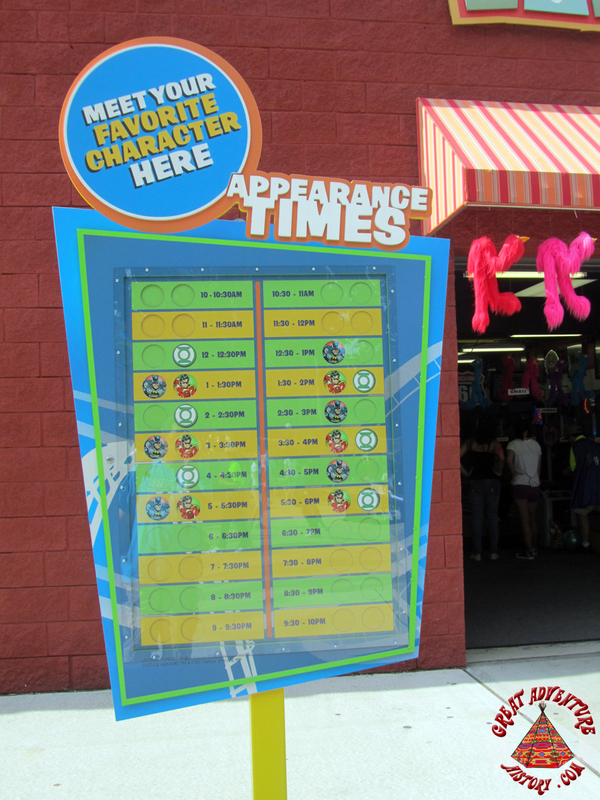 With Bally taking ownership of Six Flags, the theme parks became a showcase of their products including video games, pinball machines and even slot machines in many locations. All of these games were operated with Six Flags custom made arcade tokens. 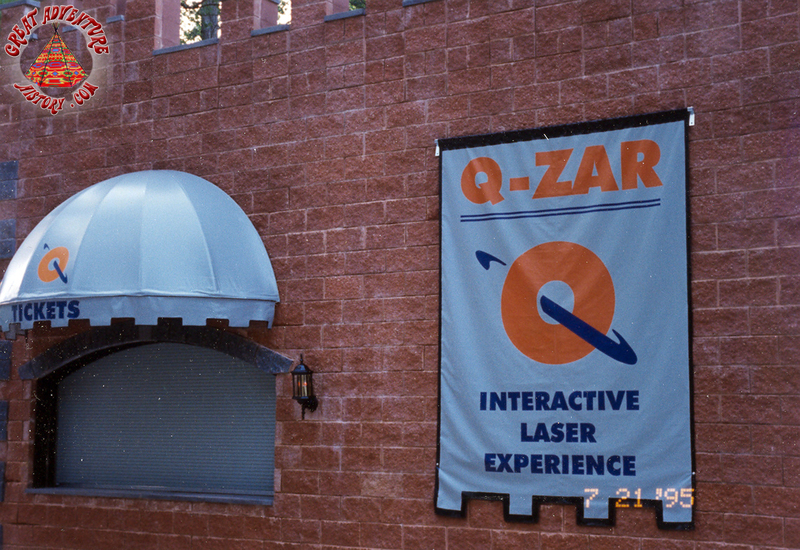 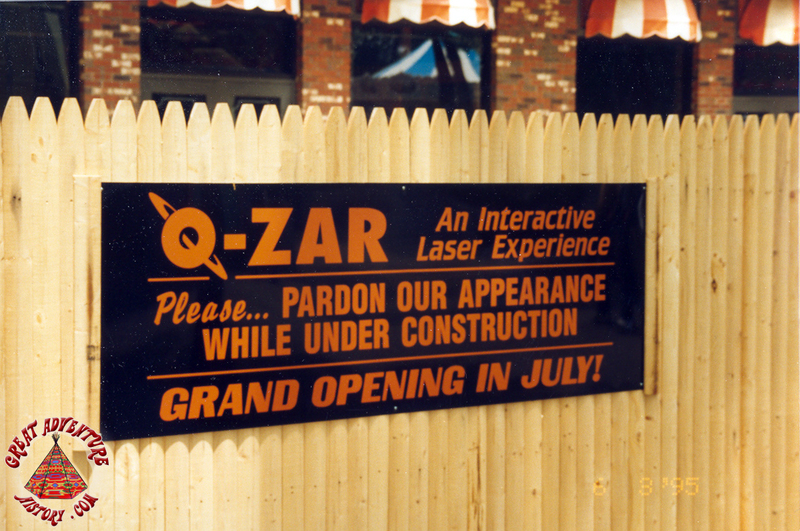 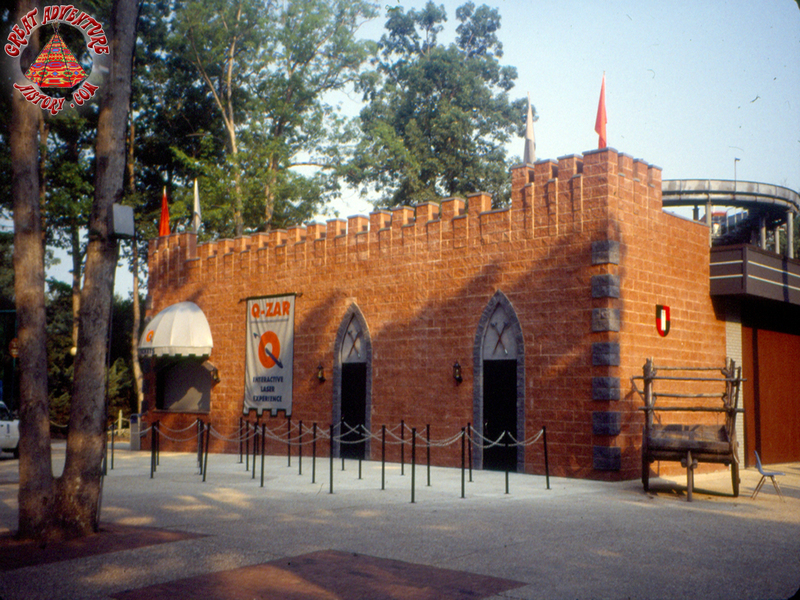 As the video game fad of the 1980's trailed off with the introduction of better home video gaming systems, the arcades in the park lost their popularity, and the Pinball Parlor was transformed into the next big trend, a lazer tag game called Q-Zar. 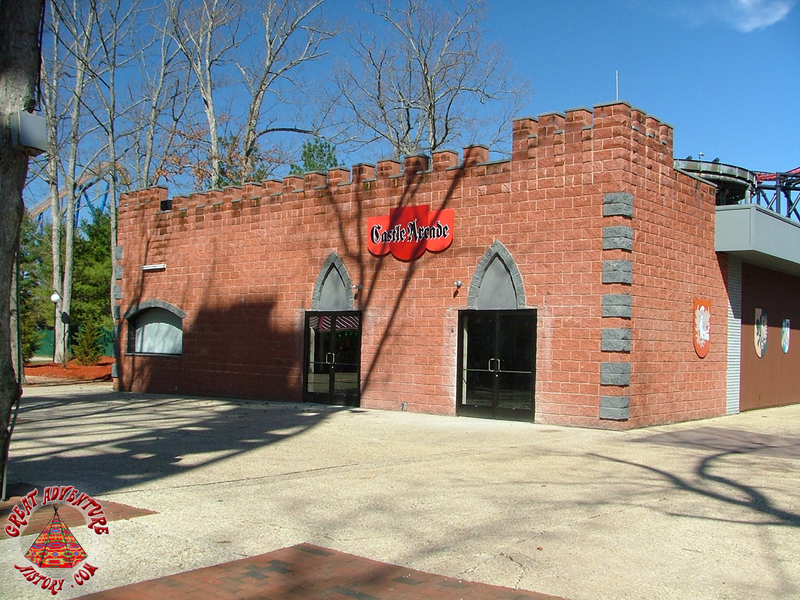 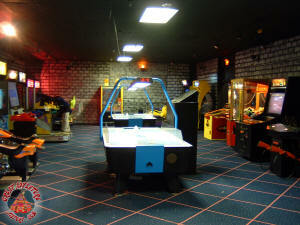 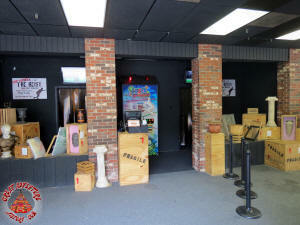 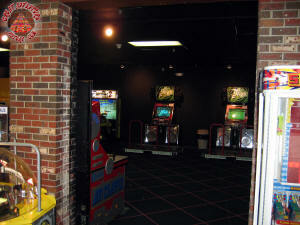 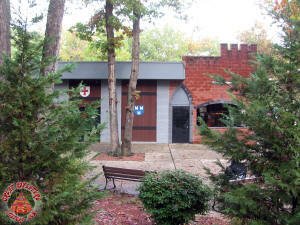 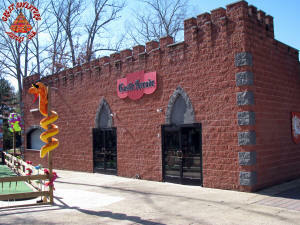 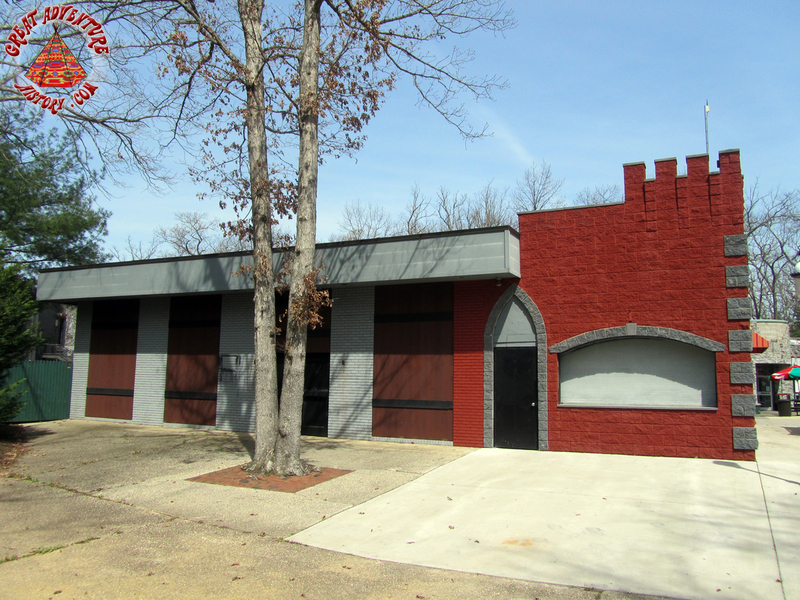 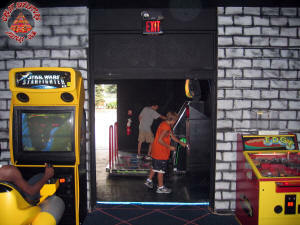 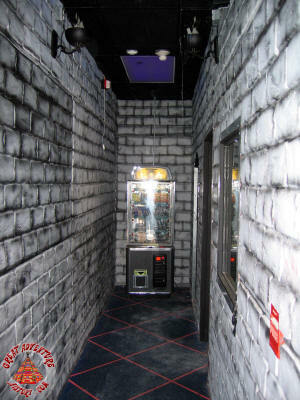 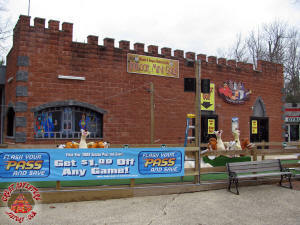 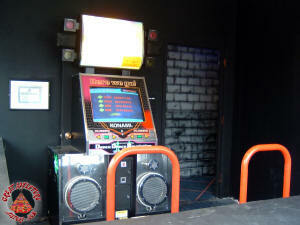 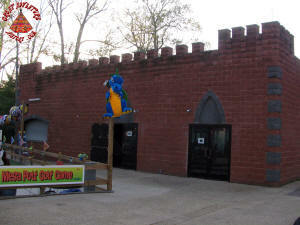 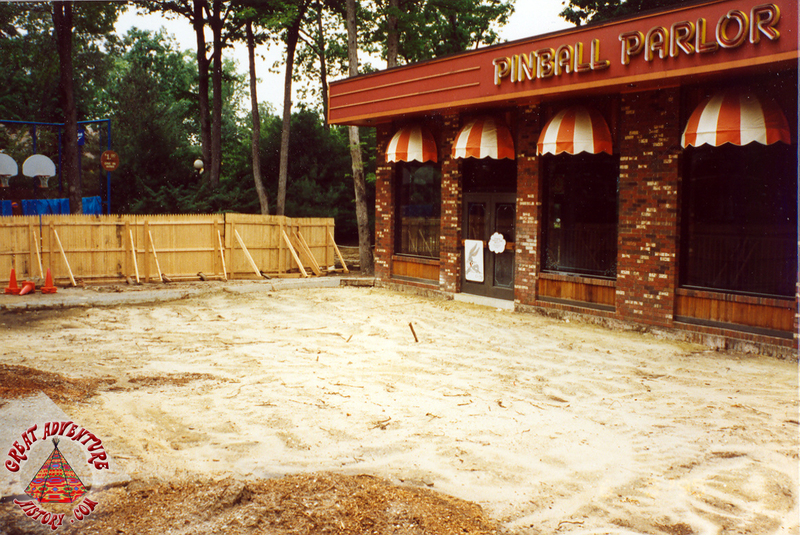 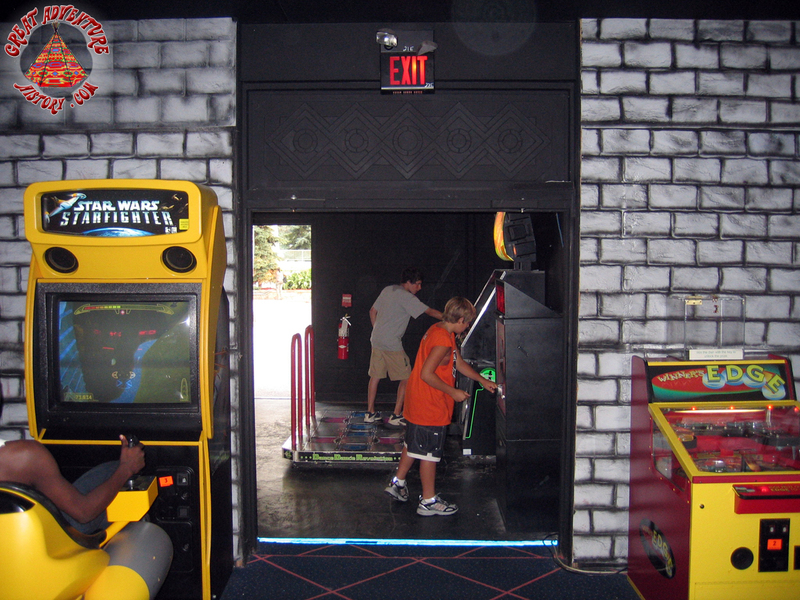 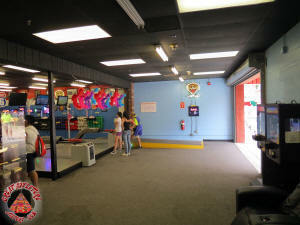 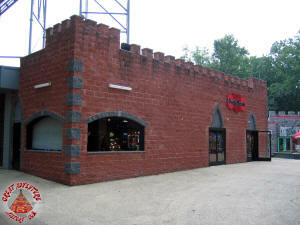 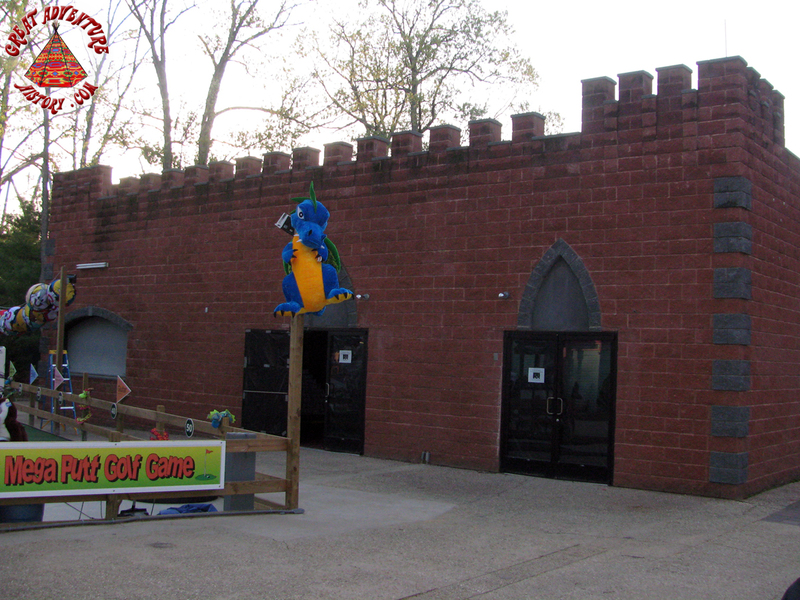 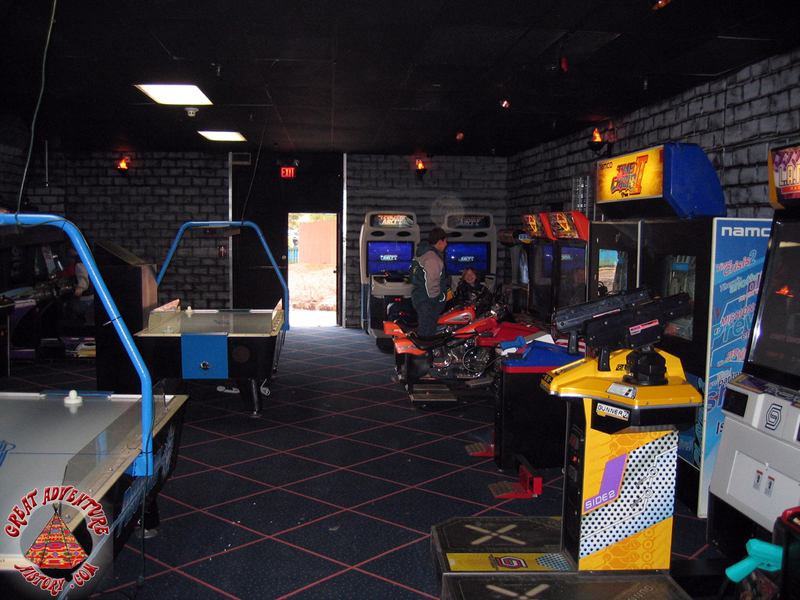 The building was expanded with a new lobby area built in front of the Pinball Parlor where guests paid and received their weapons before entering the dark labyrinth to do battle. The windows were filled in to make the building dark inside for the lazer battles. The new facade was given a medieval appearance with crenellations along the roof along with gothic arches and shields as decorations. 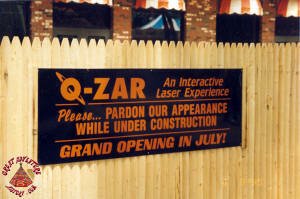 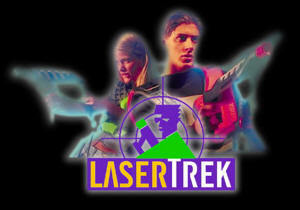 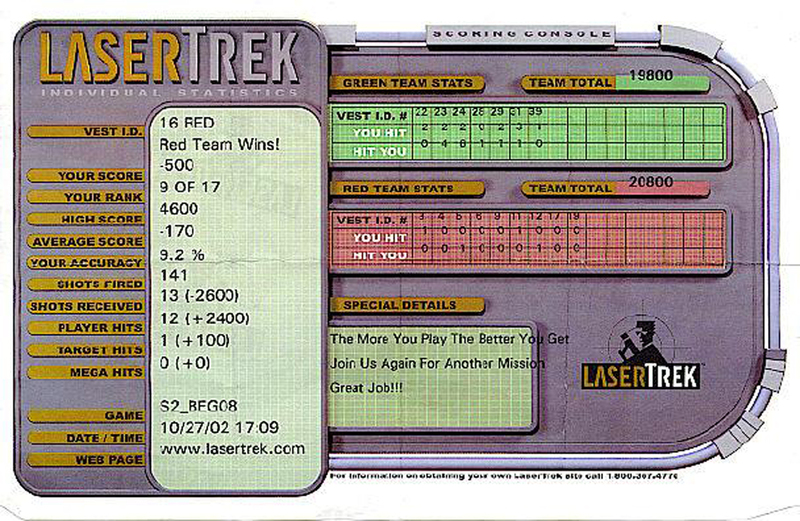 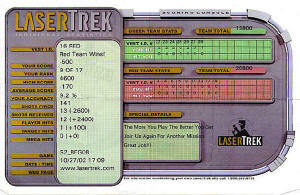 In 1999, the Q-Zar game was updated to become LaserTrek, a new lazer tag type game. 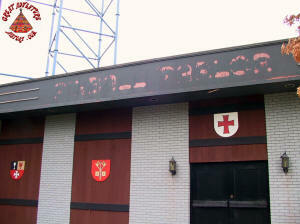 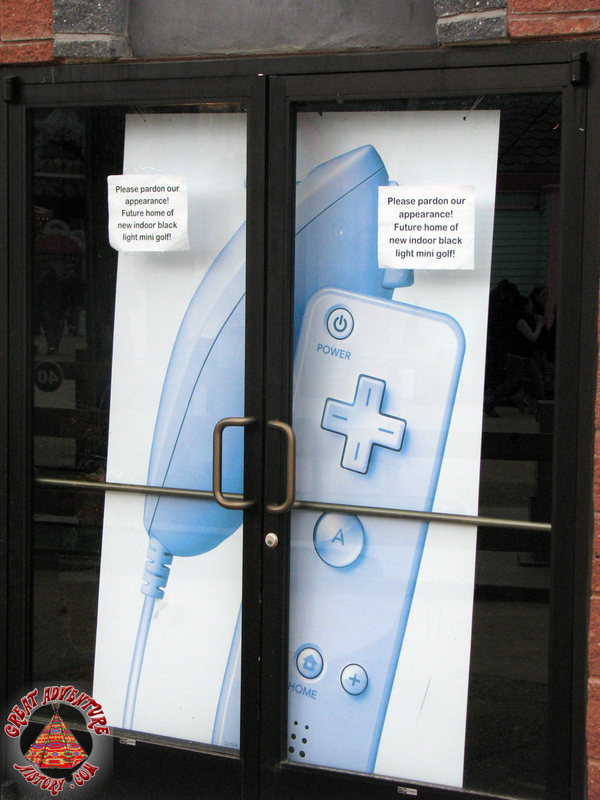 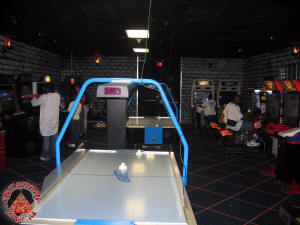 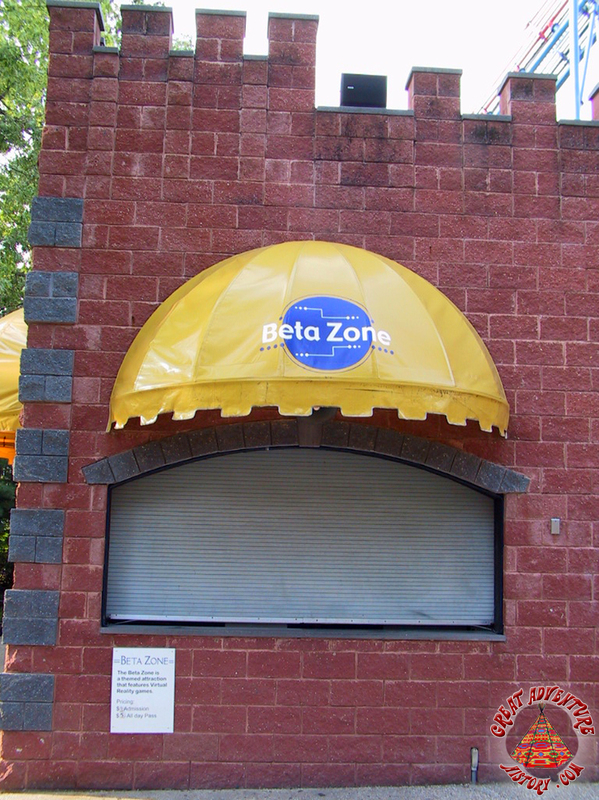 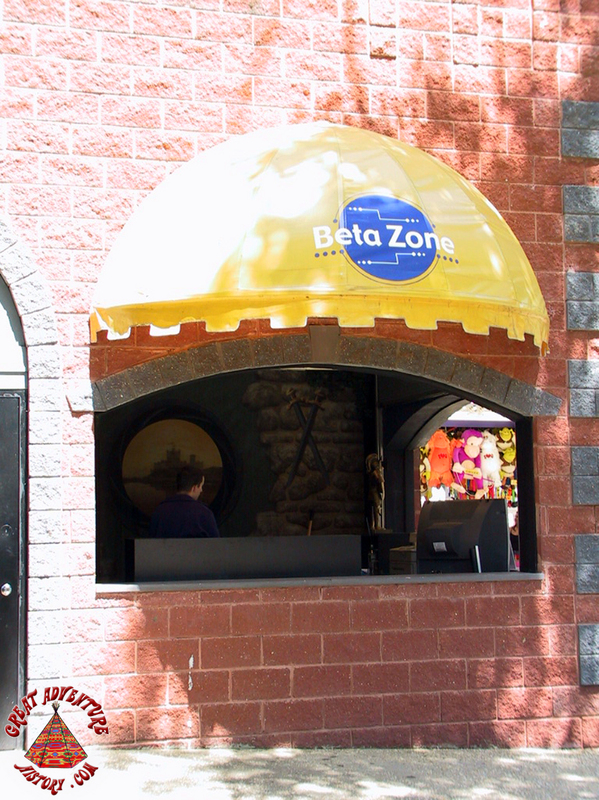 For the 2004 season the building became home to Beta Zone, another interactive indoor game. 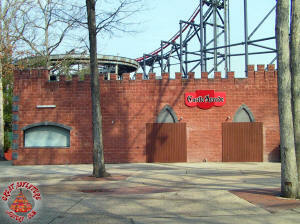 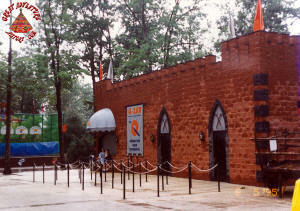 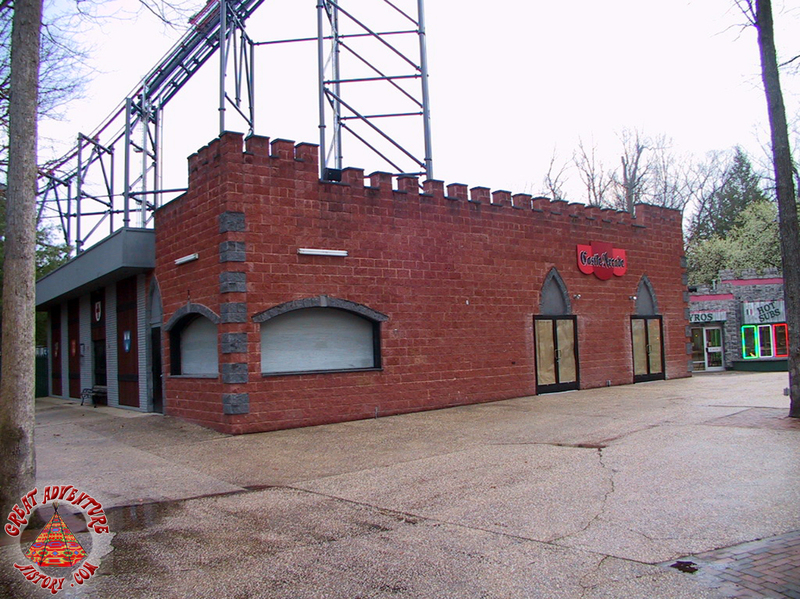 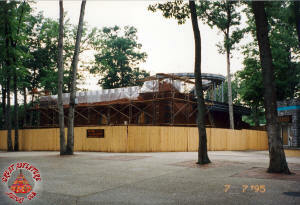 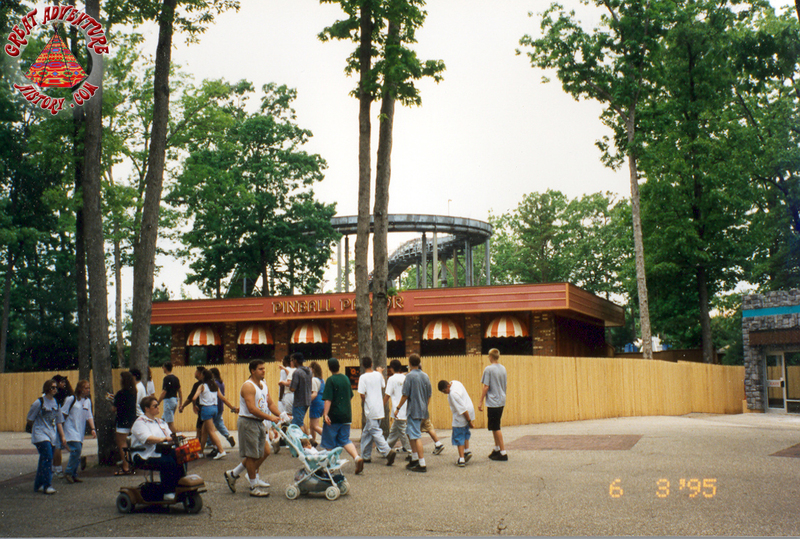 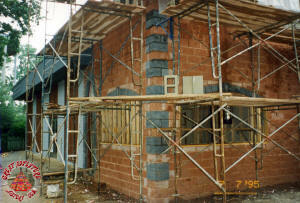 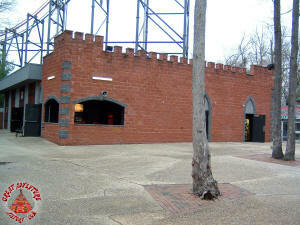 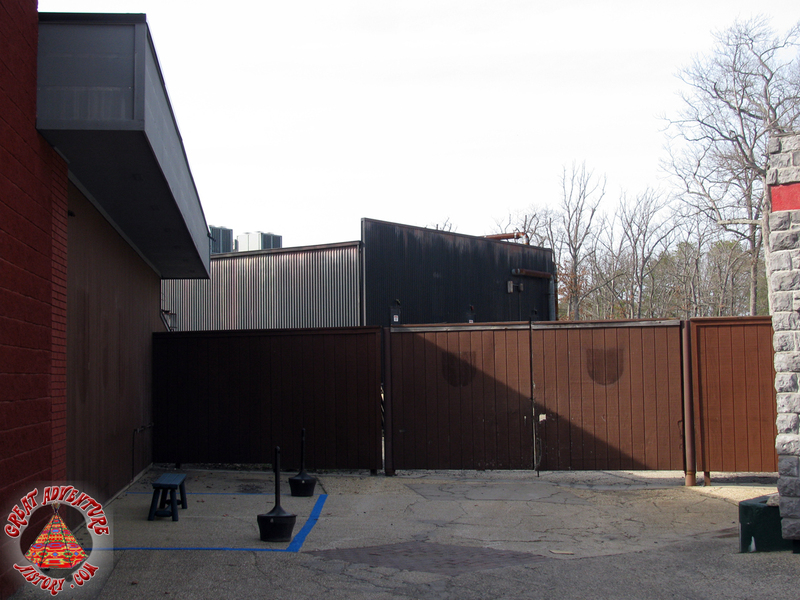 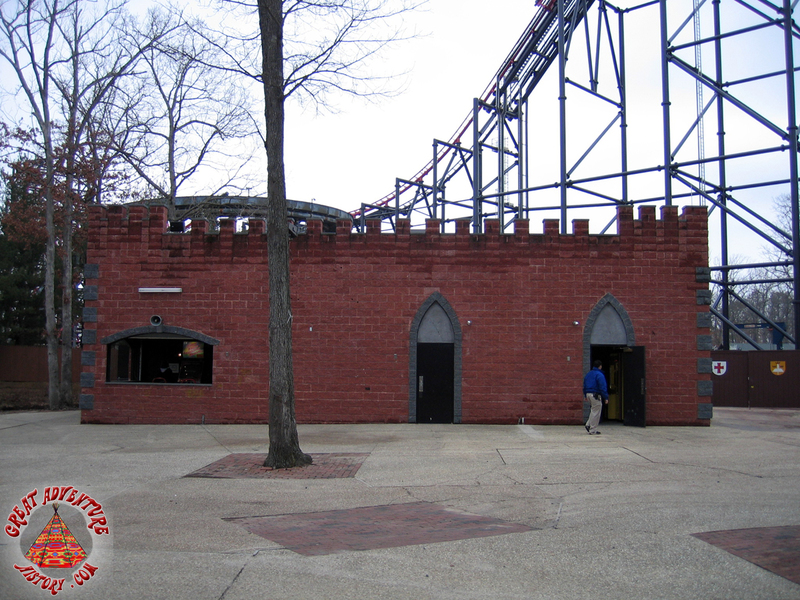 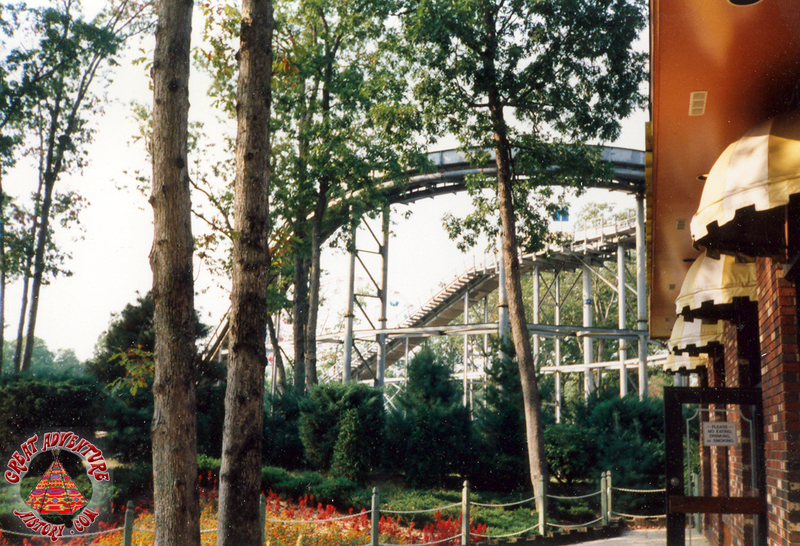 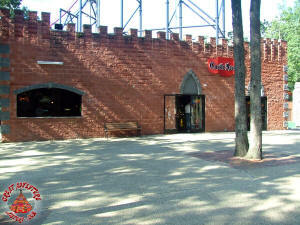 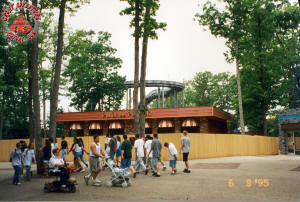 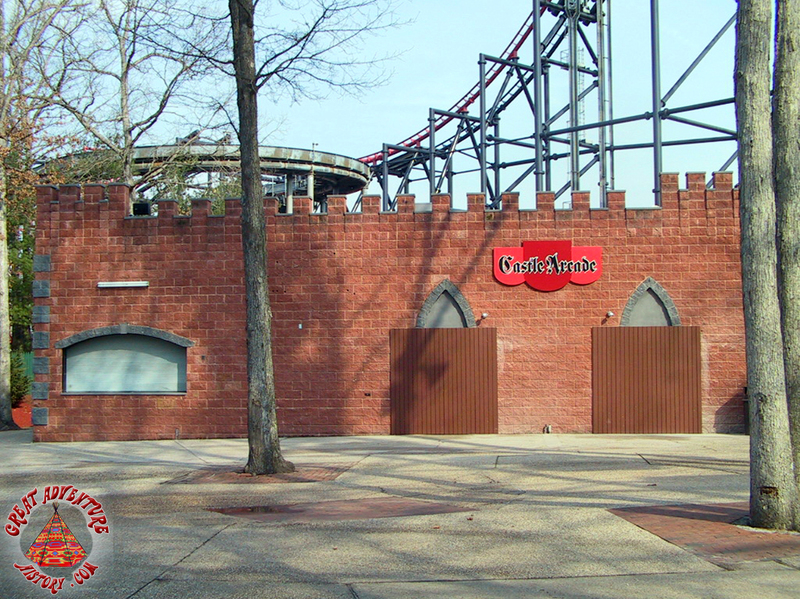 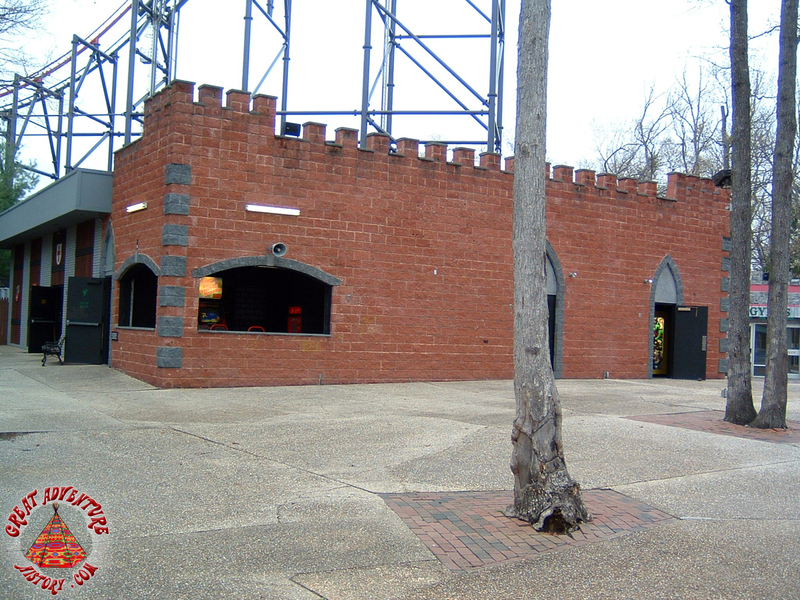 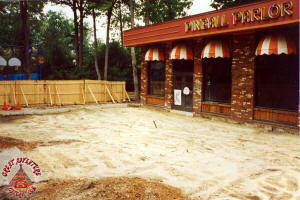 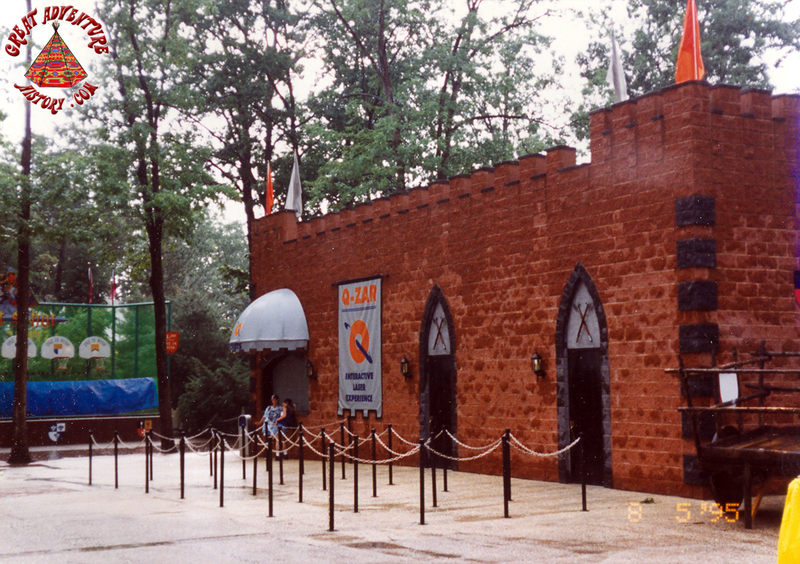 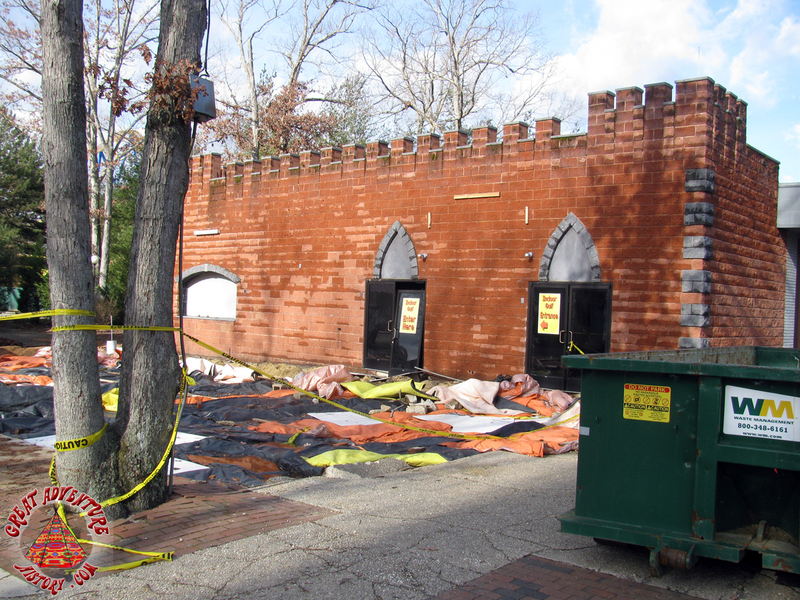 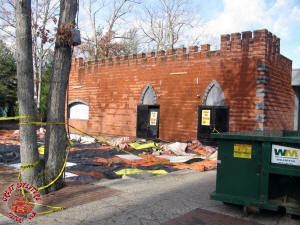 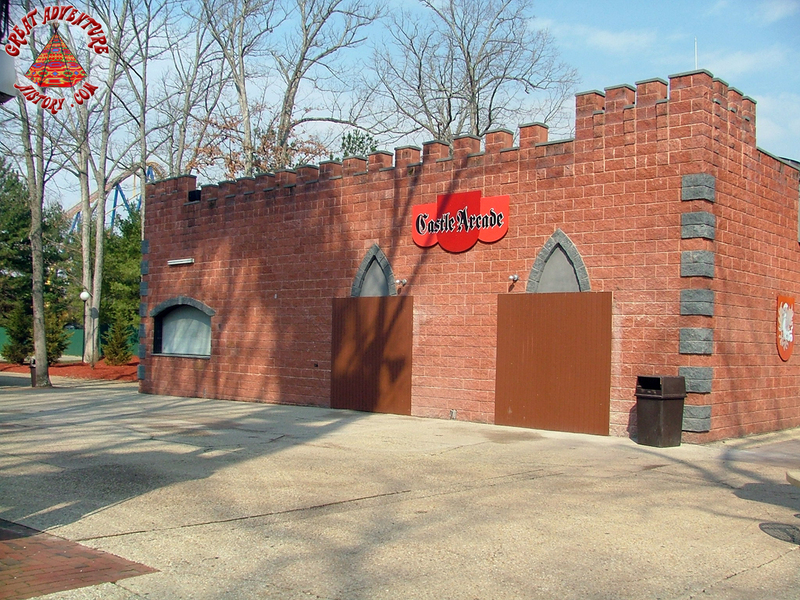 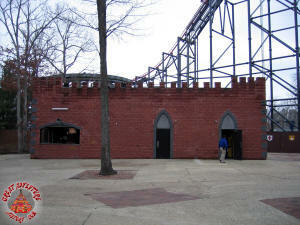 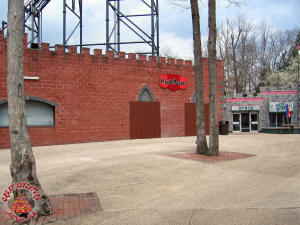 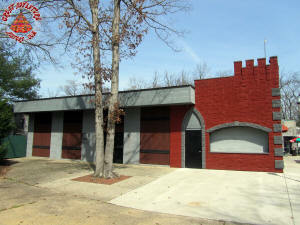 In the fall of 2004, the building was cleared of the Beta Zone equipment to make way for a new Fright Fest attraction. 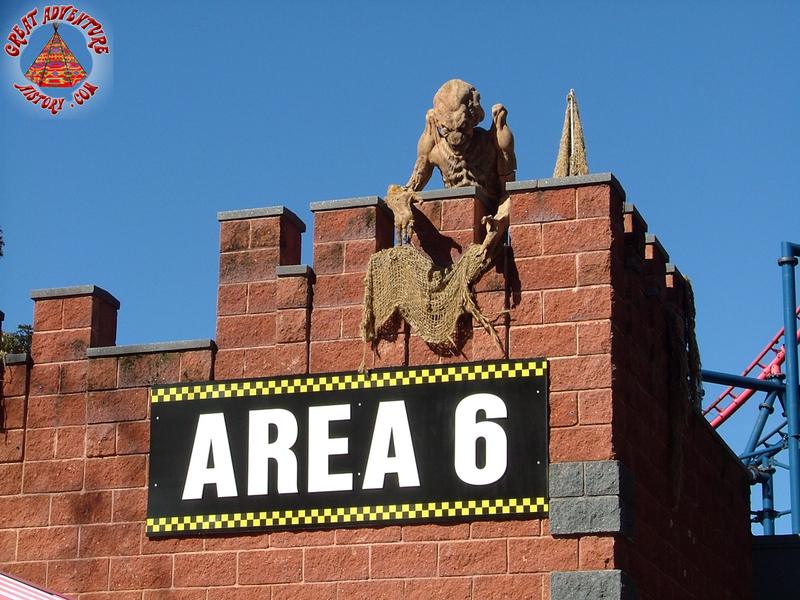 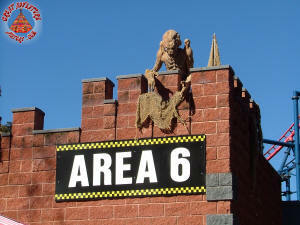 The building was transformed into Area 6, an alien themed indoor haunt attraction. 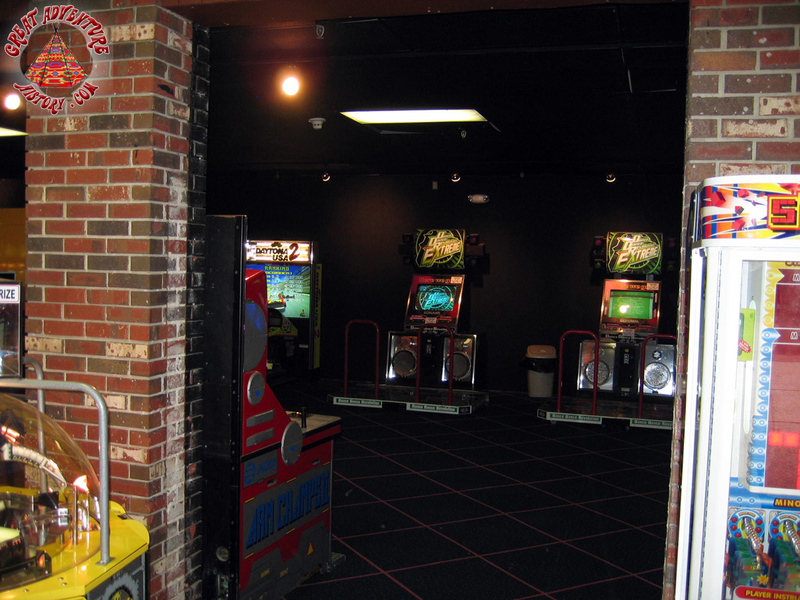 For 2005, the structure returned to its Pinball Parlor roots, becoming an arcade once more. 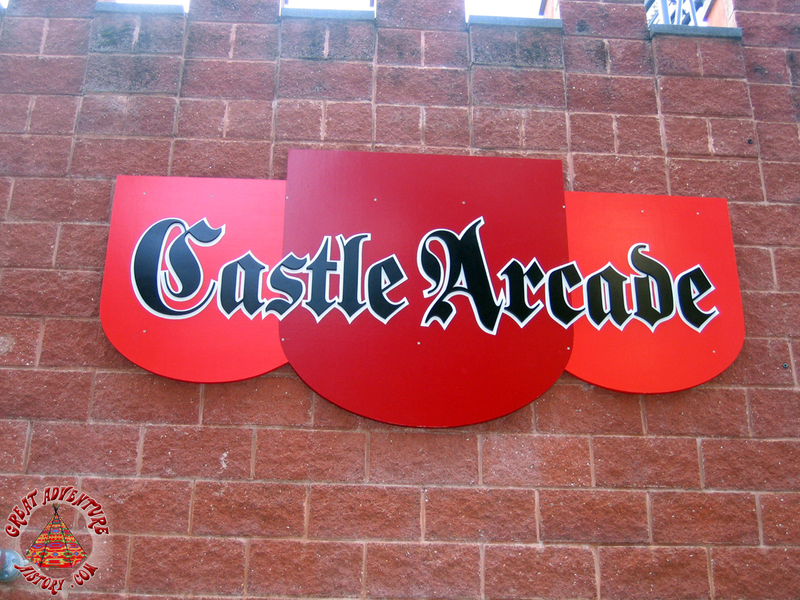 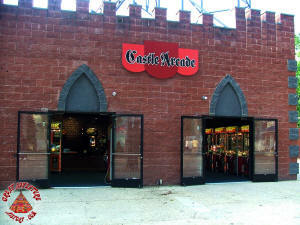 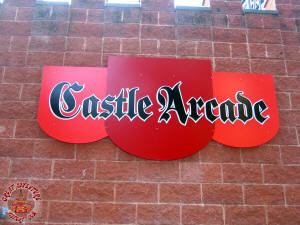 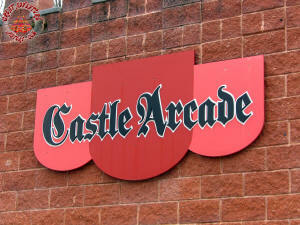 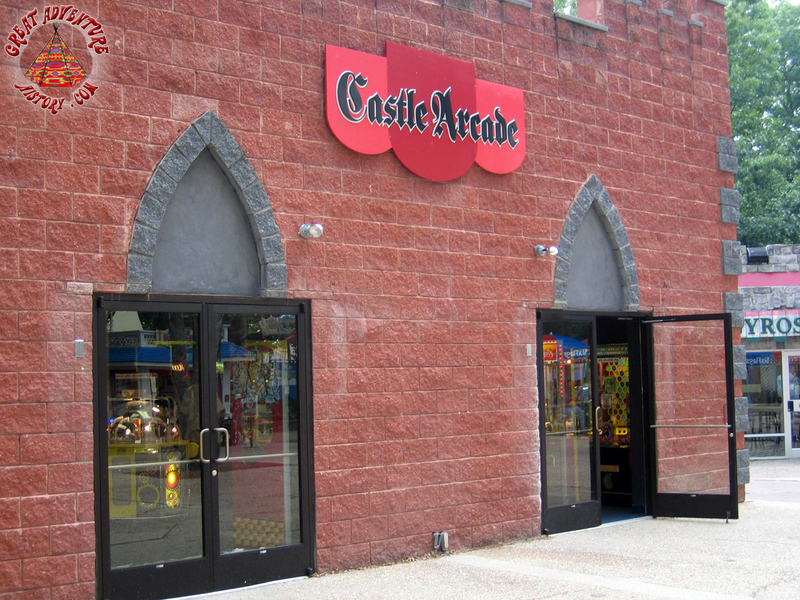 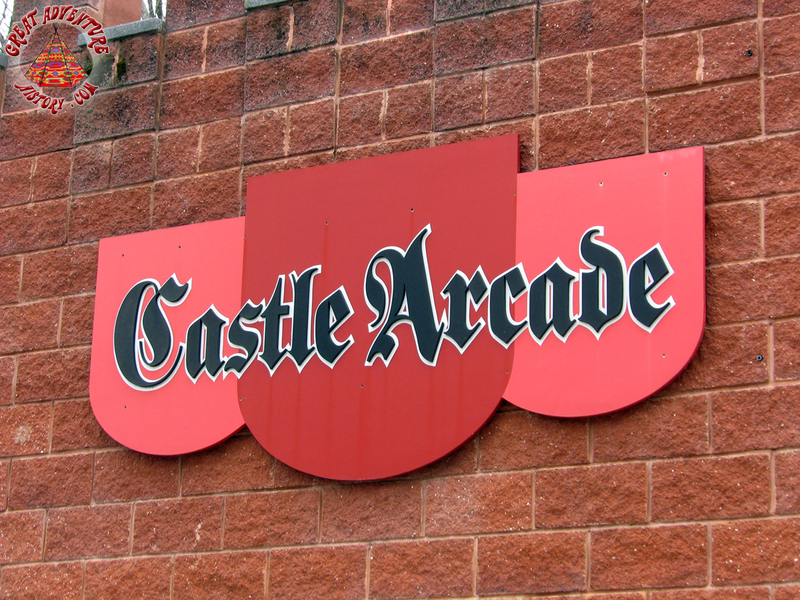 The building re-opened as Castle Arcade and featured a selection of classic arcade games. 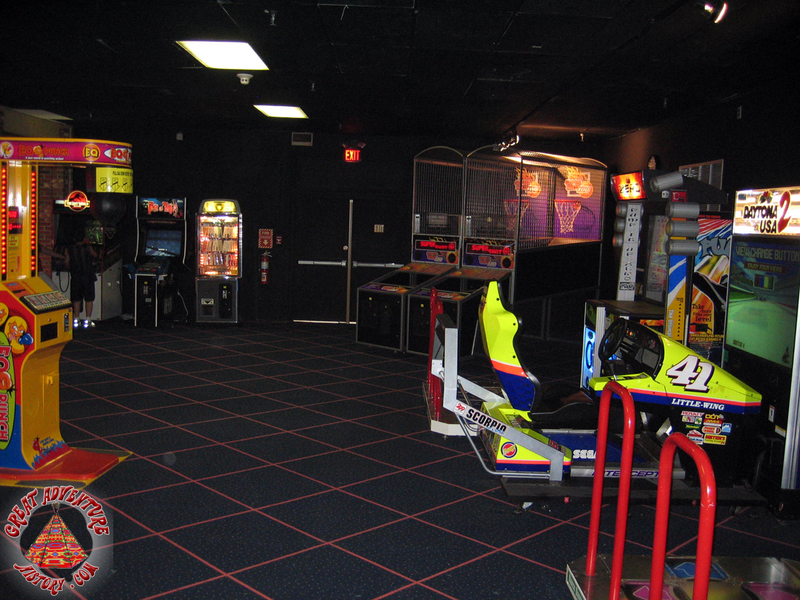 Video games were no longer the huge draw they once were, and the arcade was populated with claw machines and dance challenge games like Dance Dance Revolution. 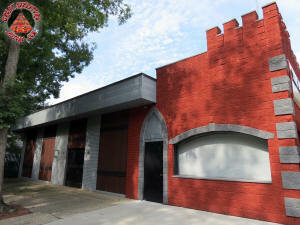 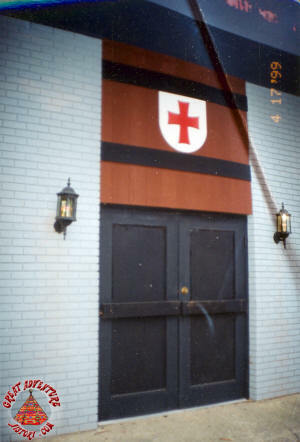 The facade was modified with larger doors to try and bring more guests in past the rather plain exterior. 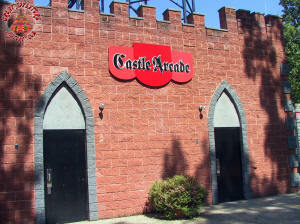 As gaming area, Castle Arcade never saw too many guests. The oddly configured interior layout was a result of all the modifications made over time. 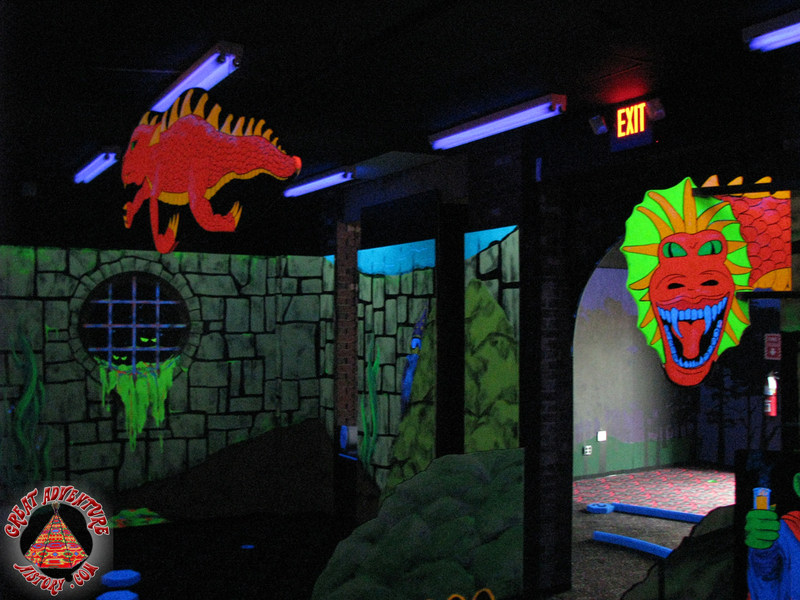 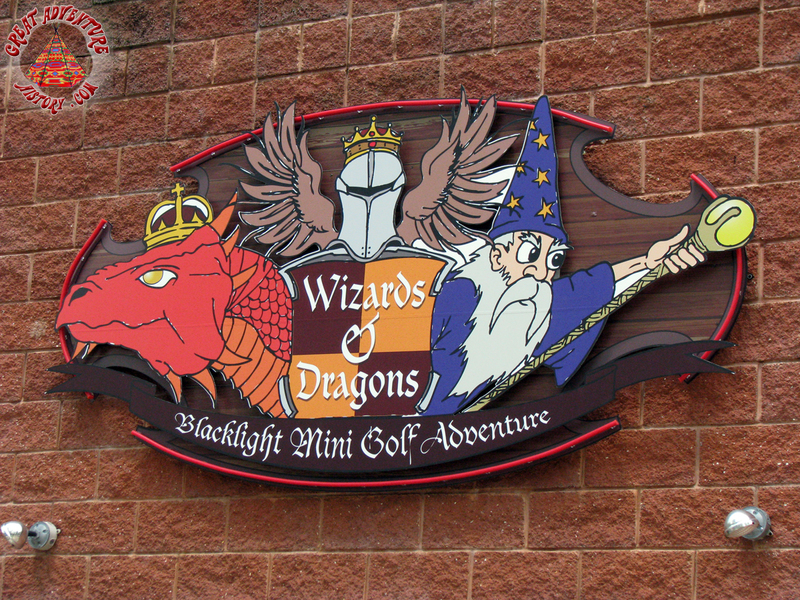 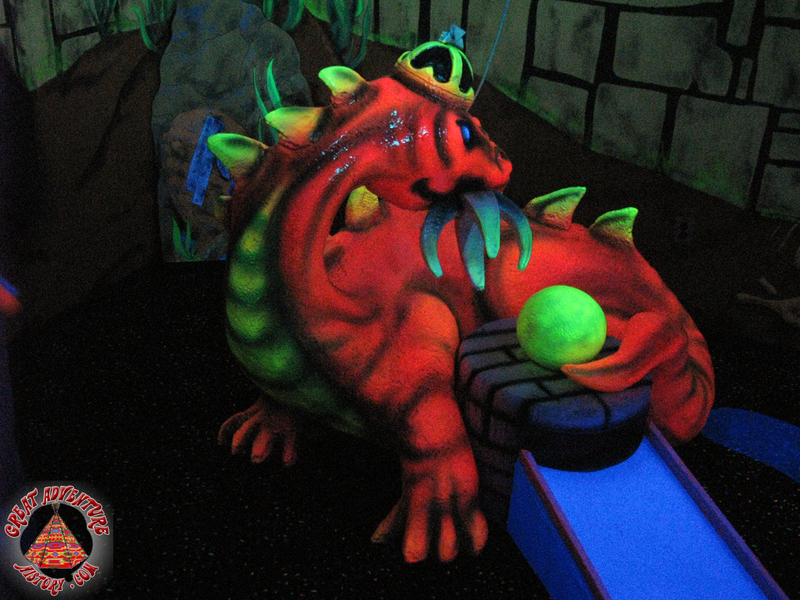 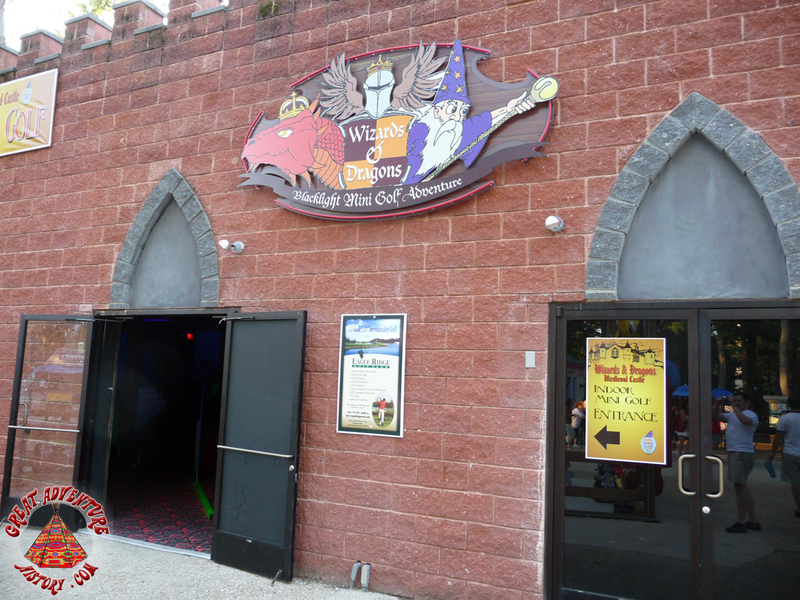 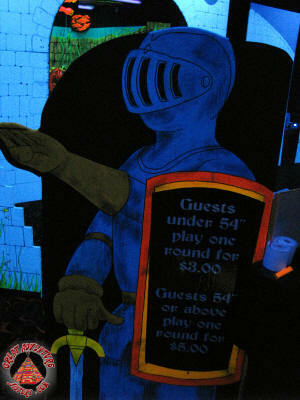 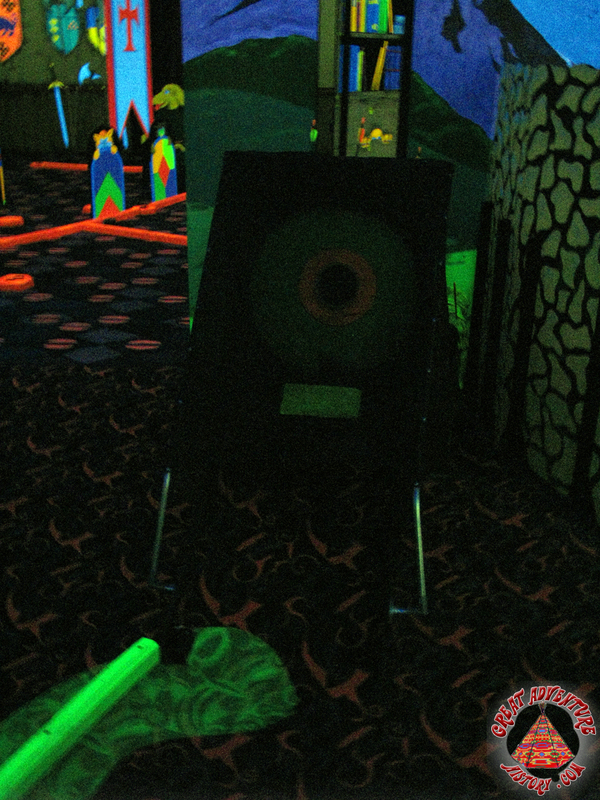 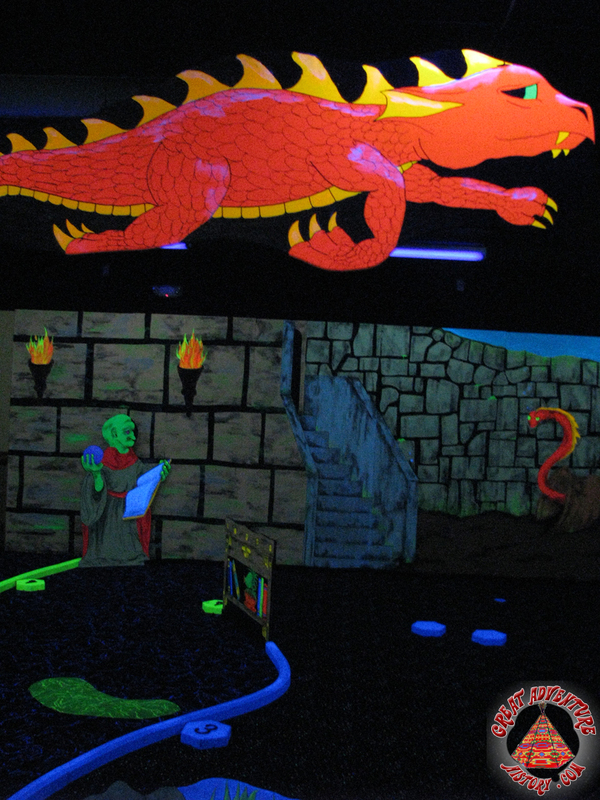 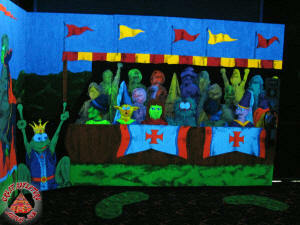 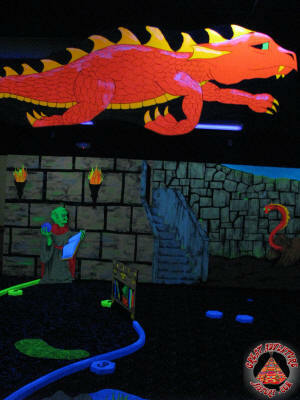 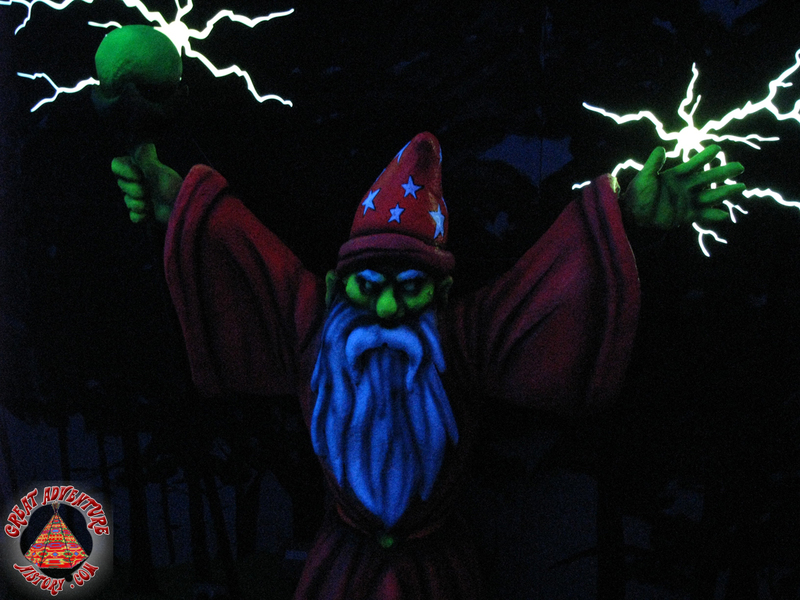 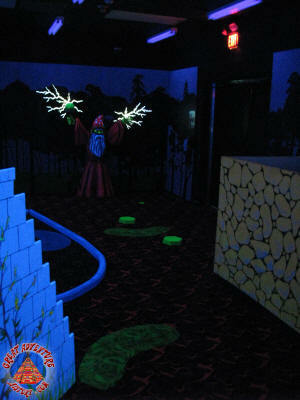 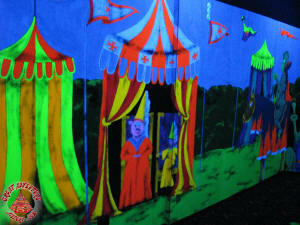 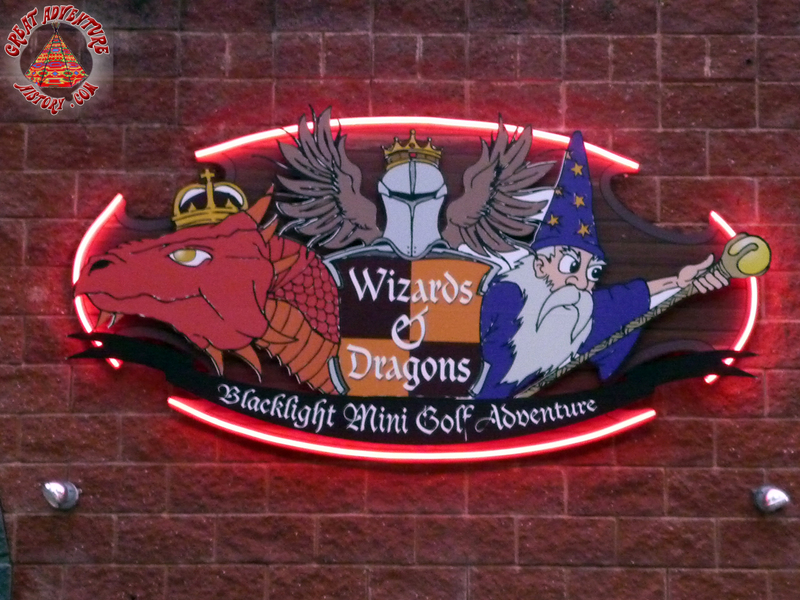 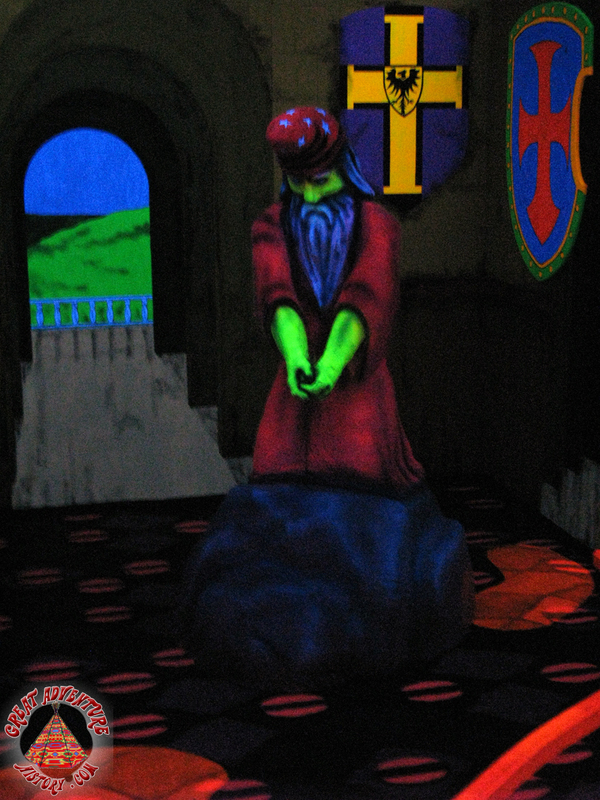 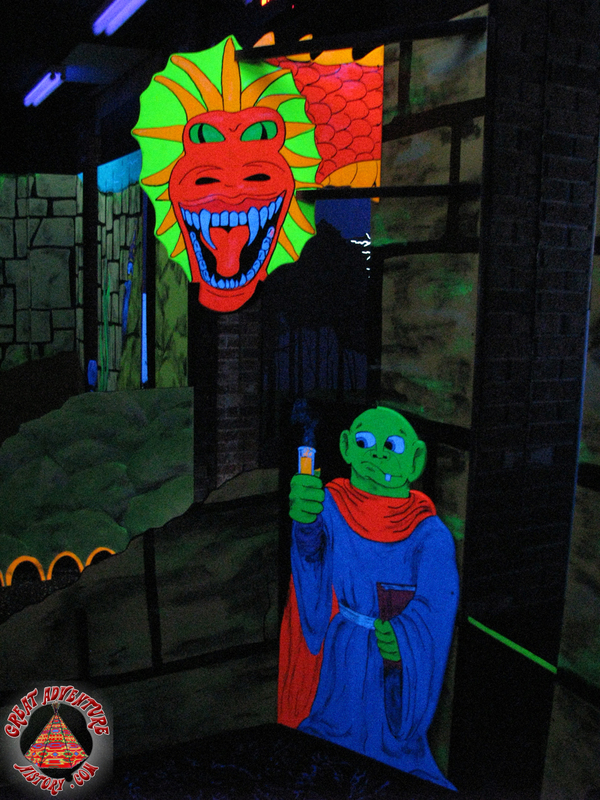 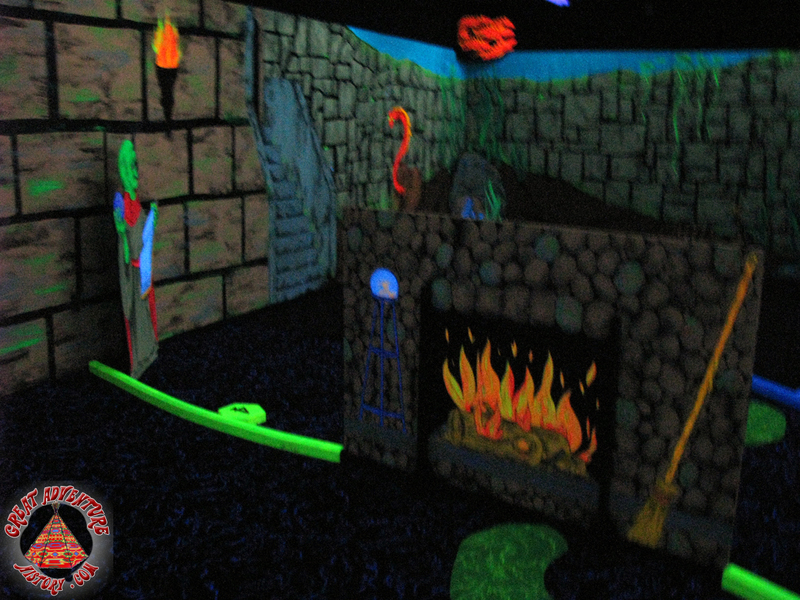 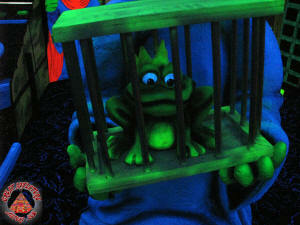 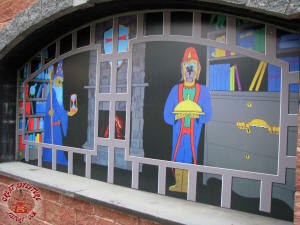 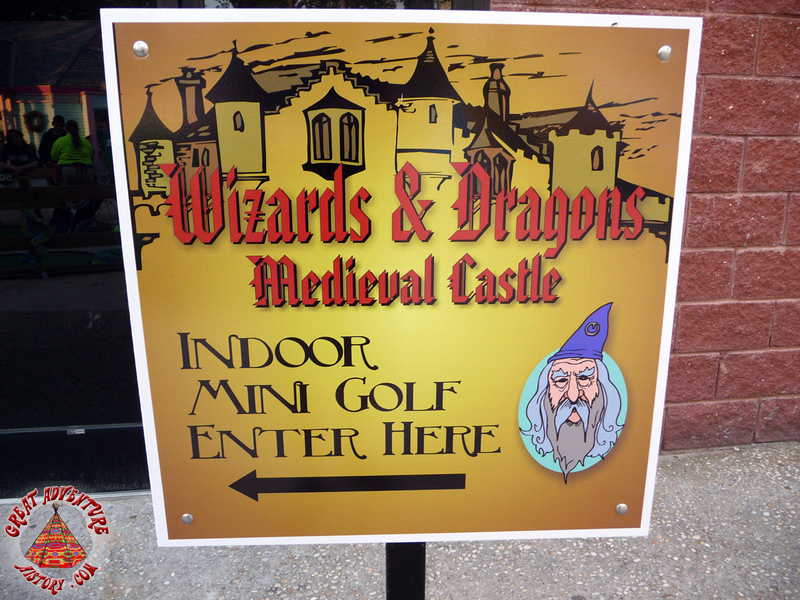 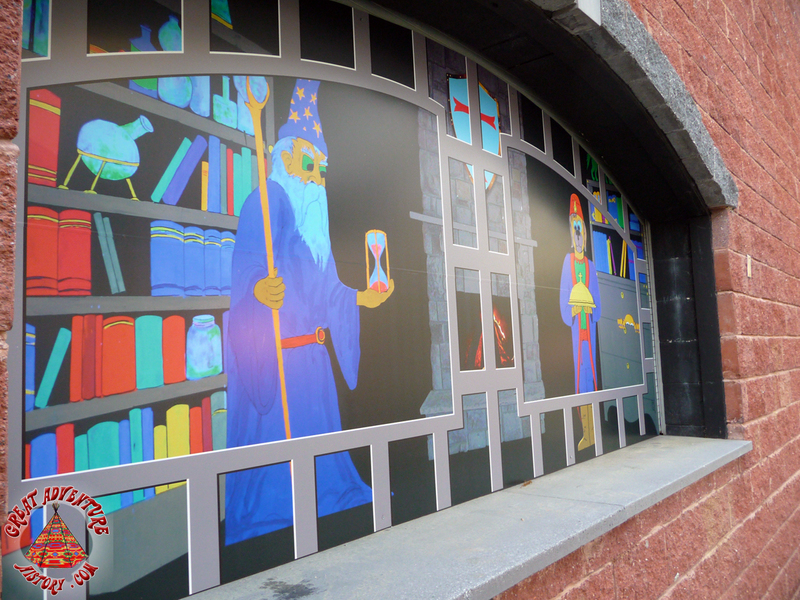 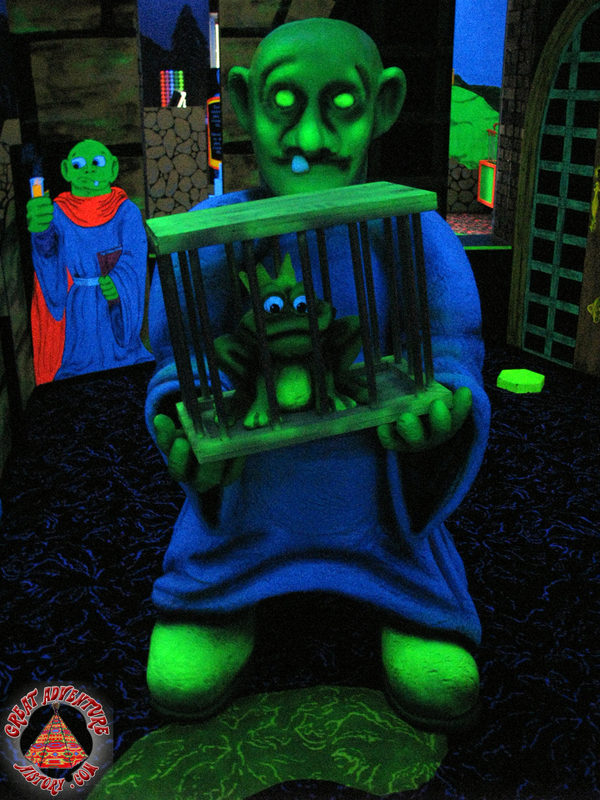 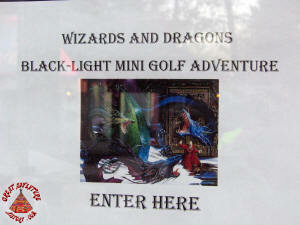 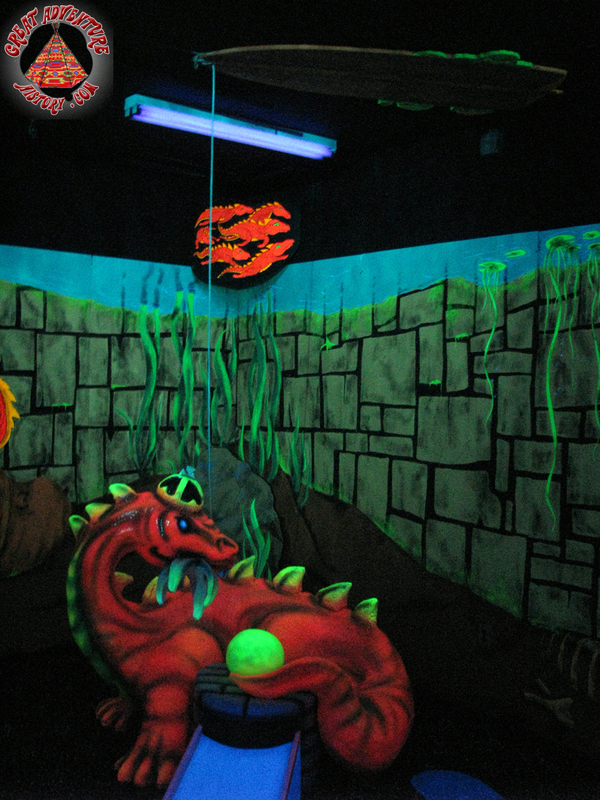 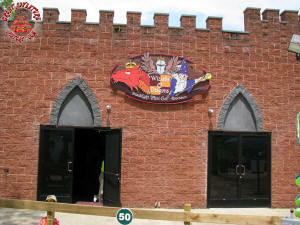 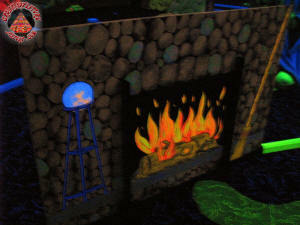 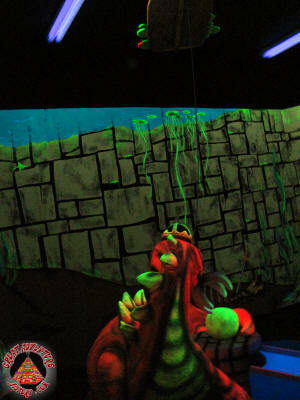 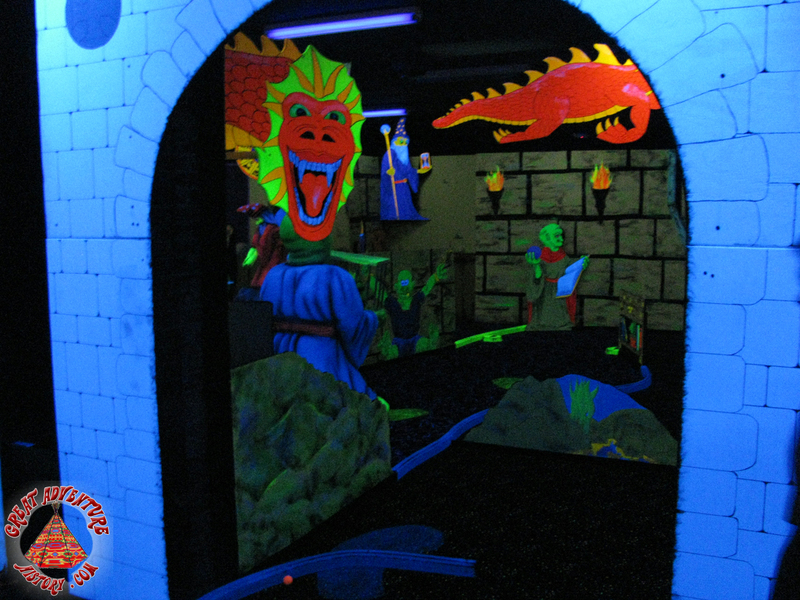 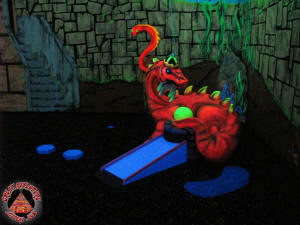 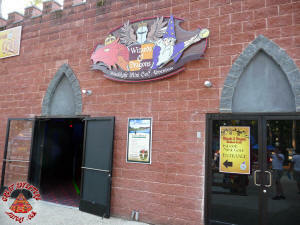 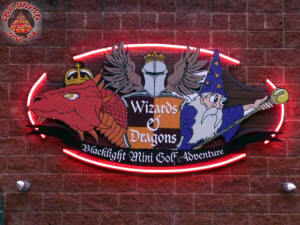 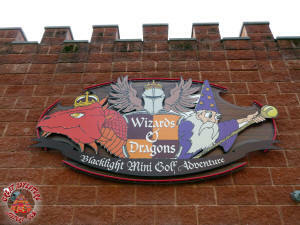 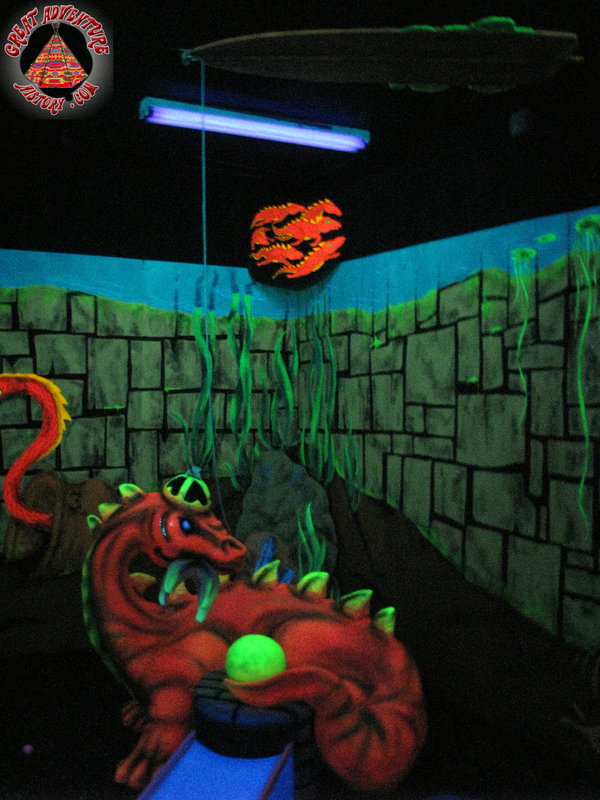 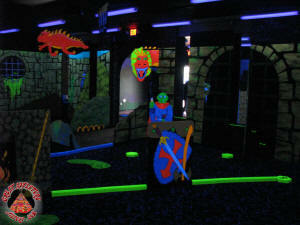 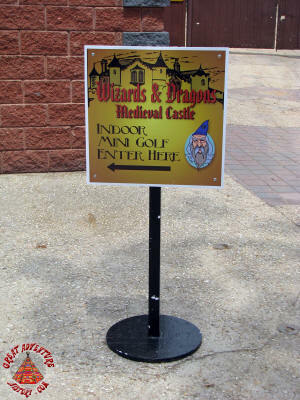 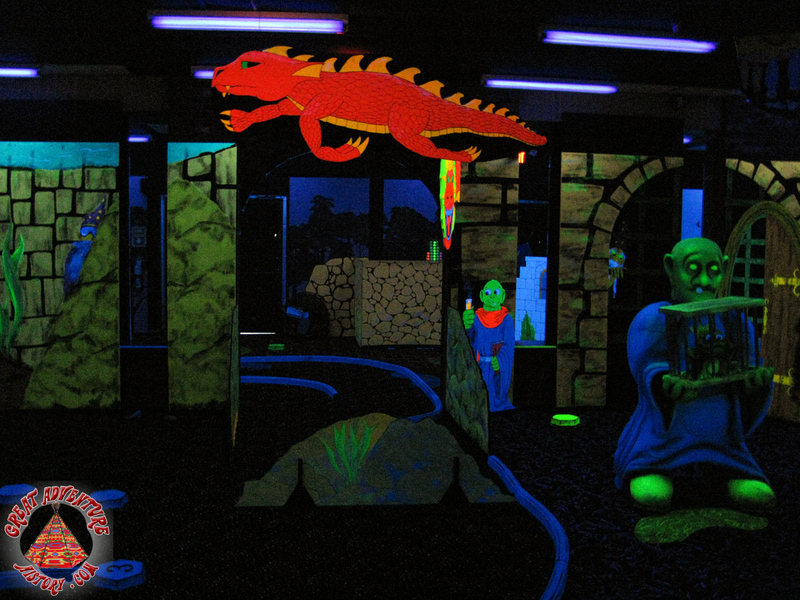 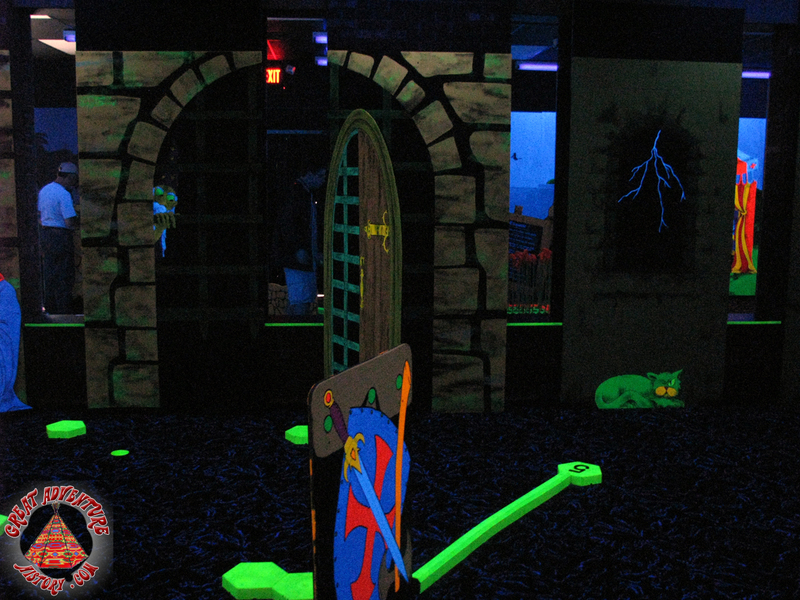 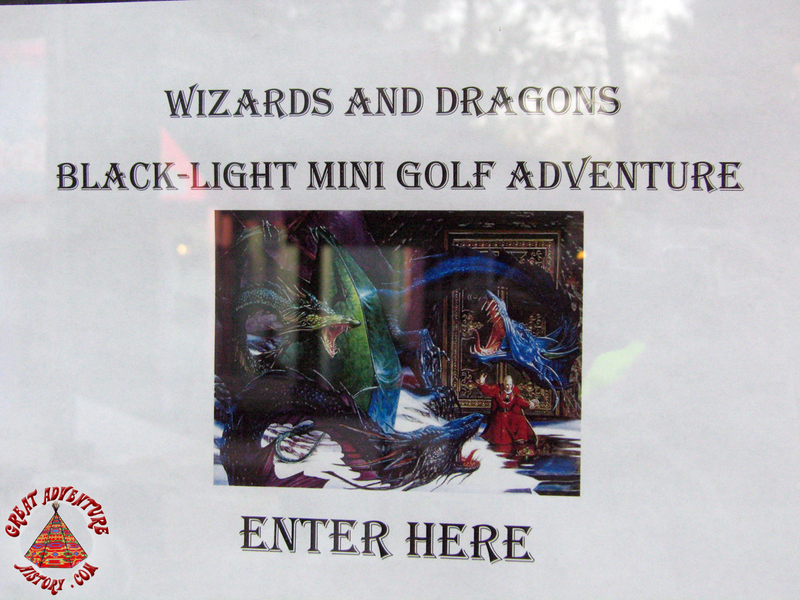 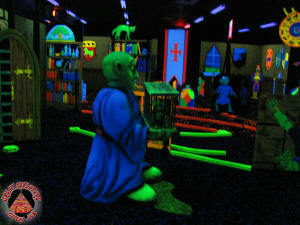 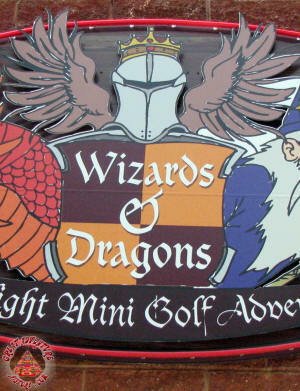 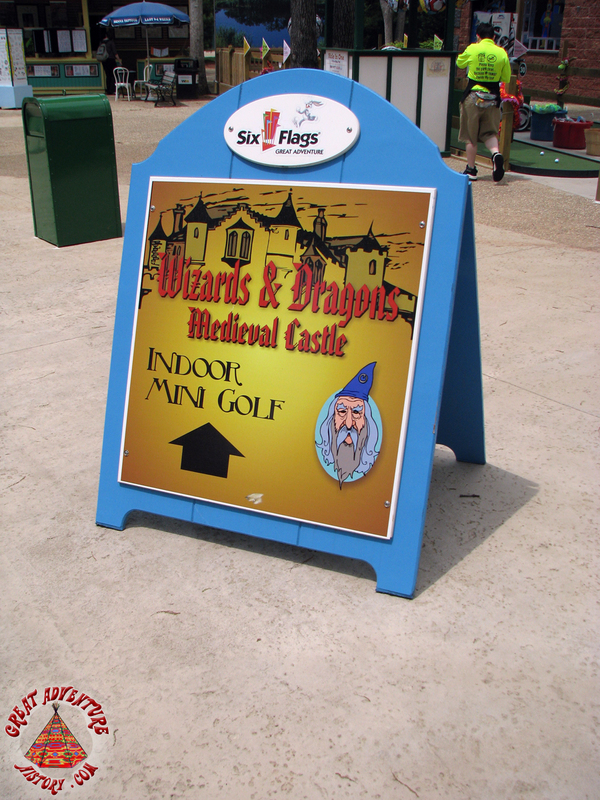 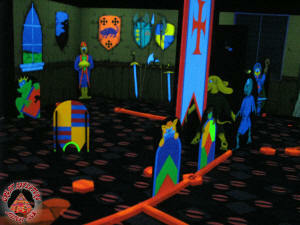 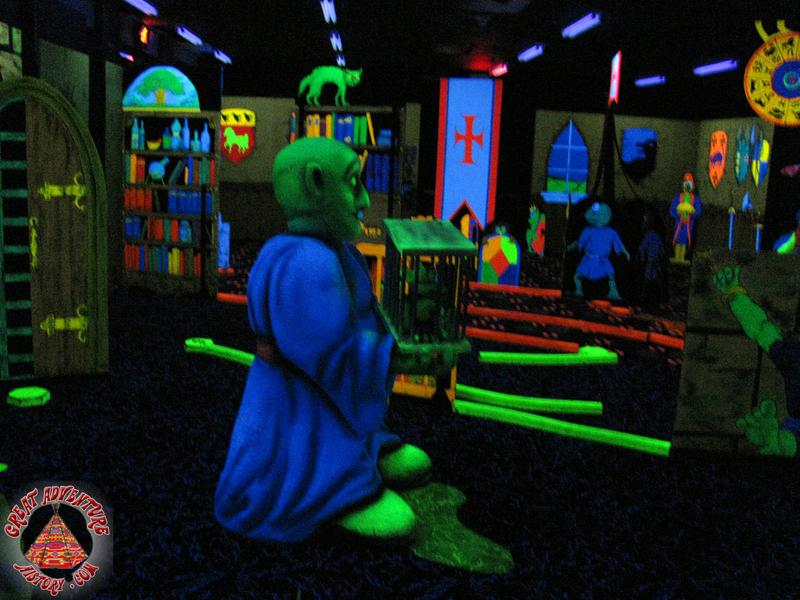 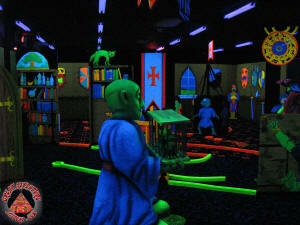 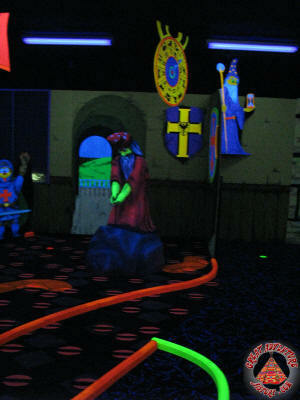 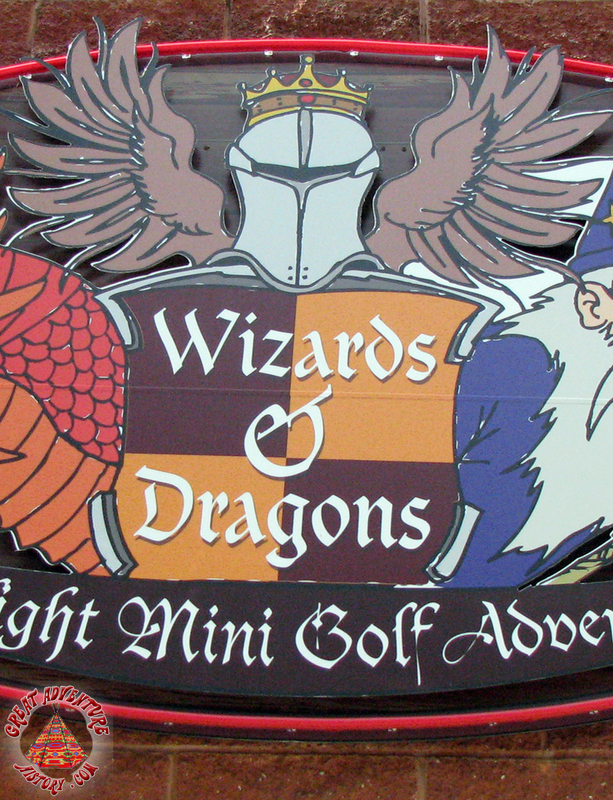 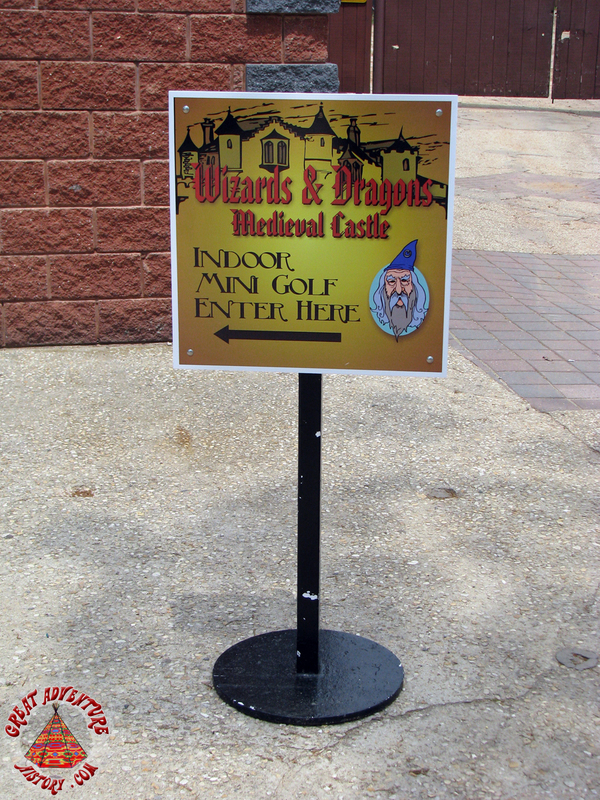 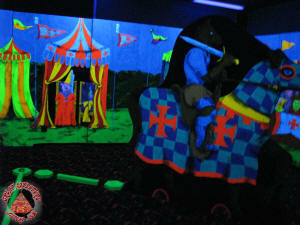 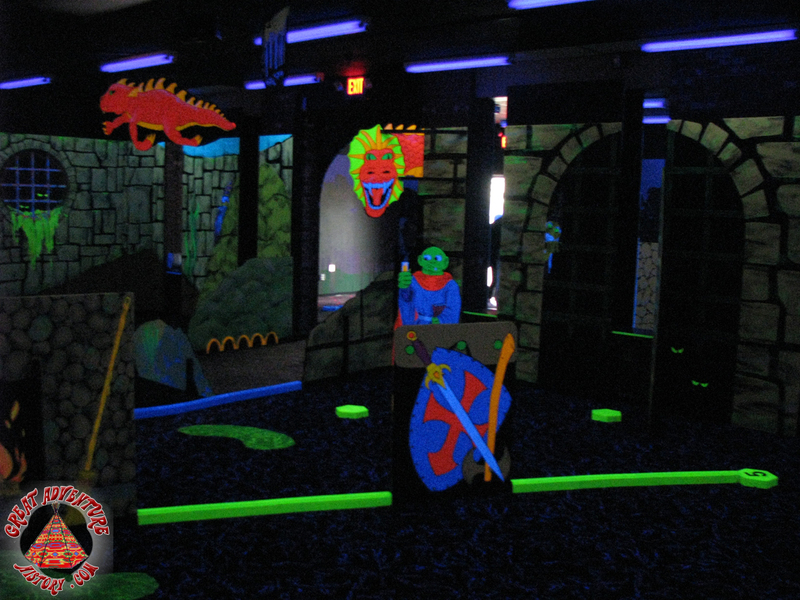 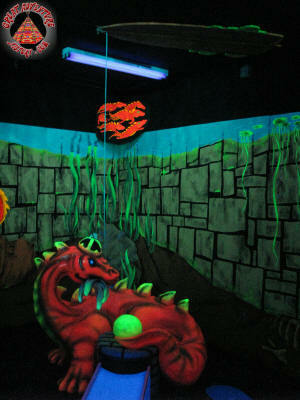 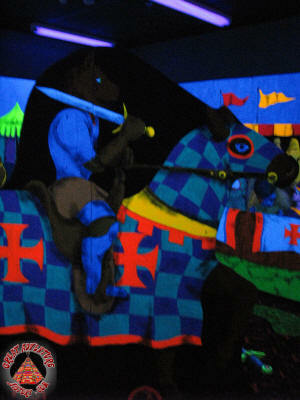 For the 2008 season the Pinball Parlor took on a new identity as the Wizards & Dragons Blacklight Mini Golf Adventure. 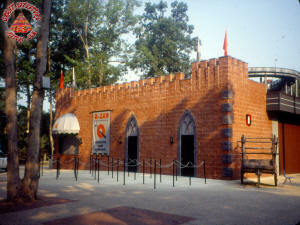 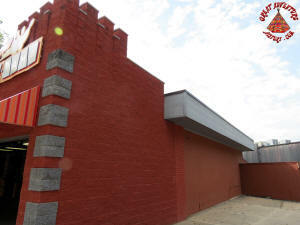 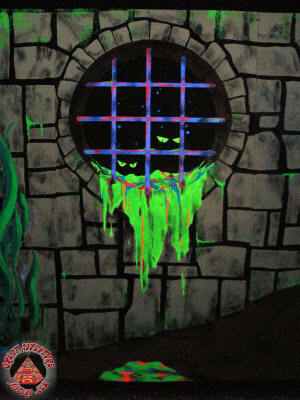 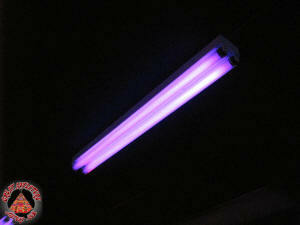 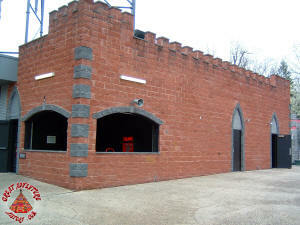 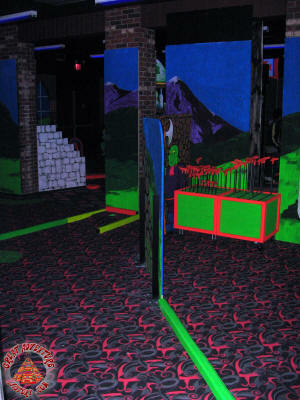 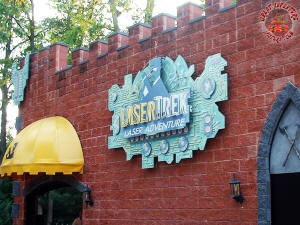 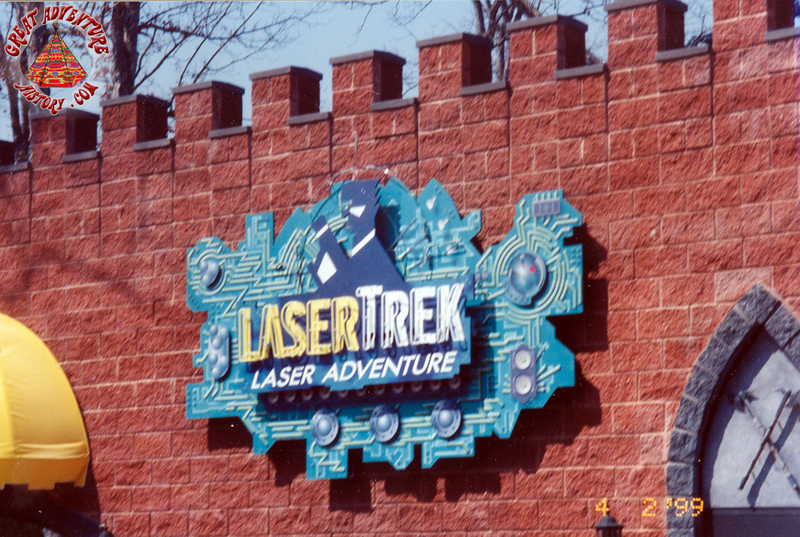 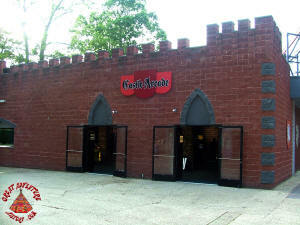 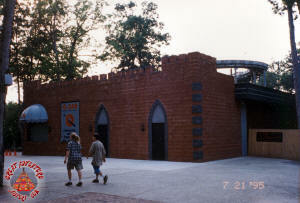 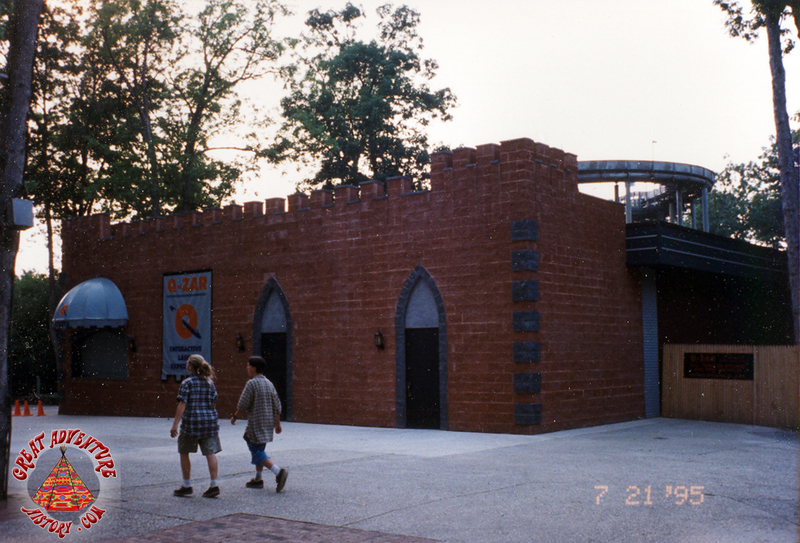 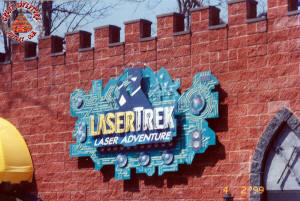 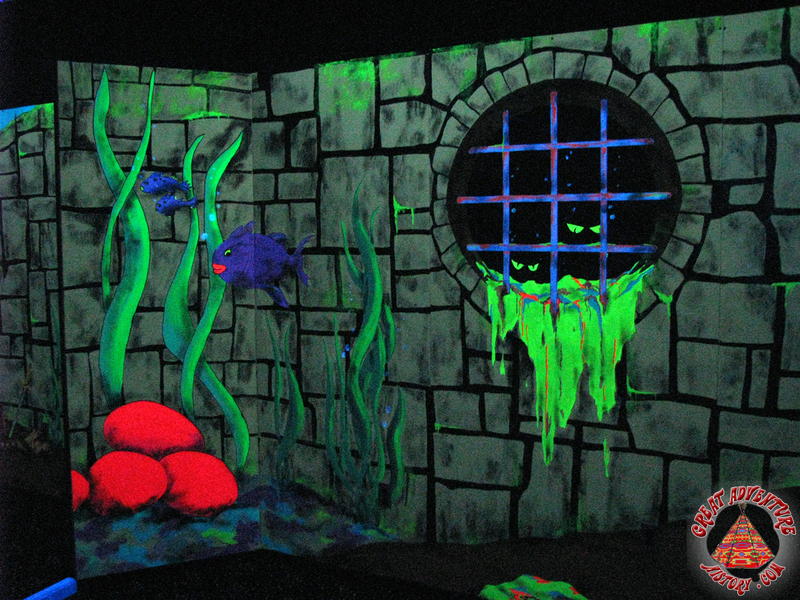 The new attraction took advantage of the building's already darkened interior from its time as a lazer tag attraction. 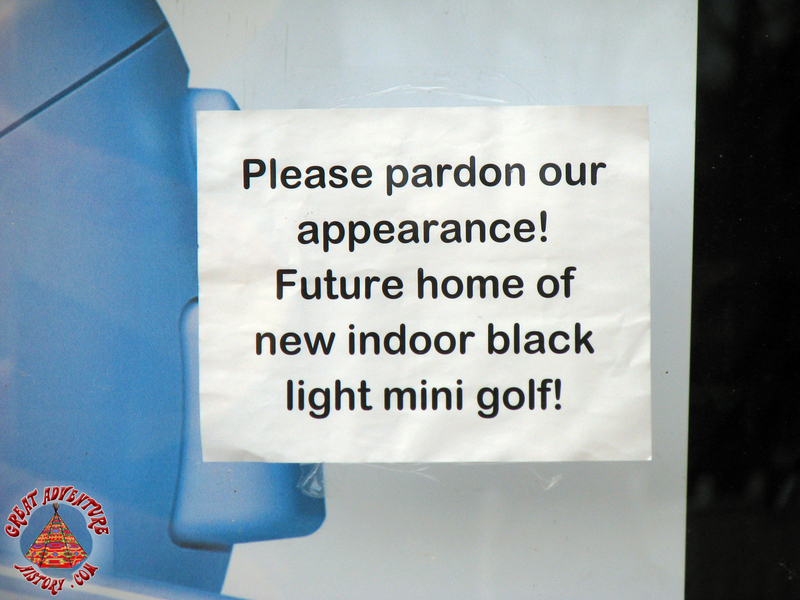 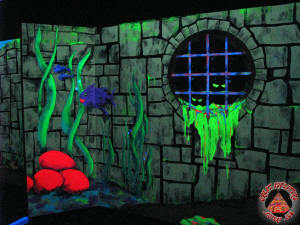 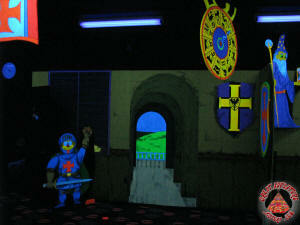 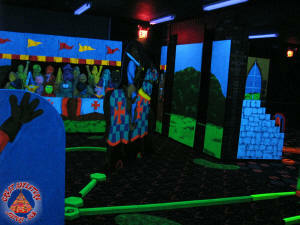 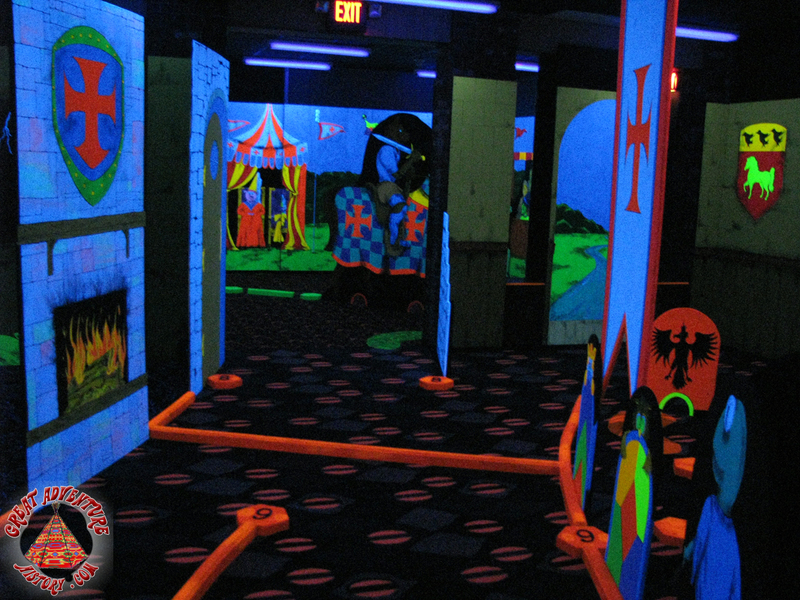 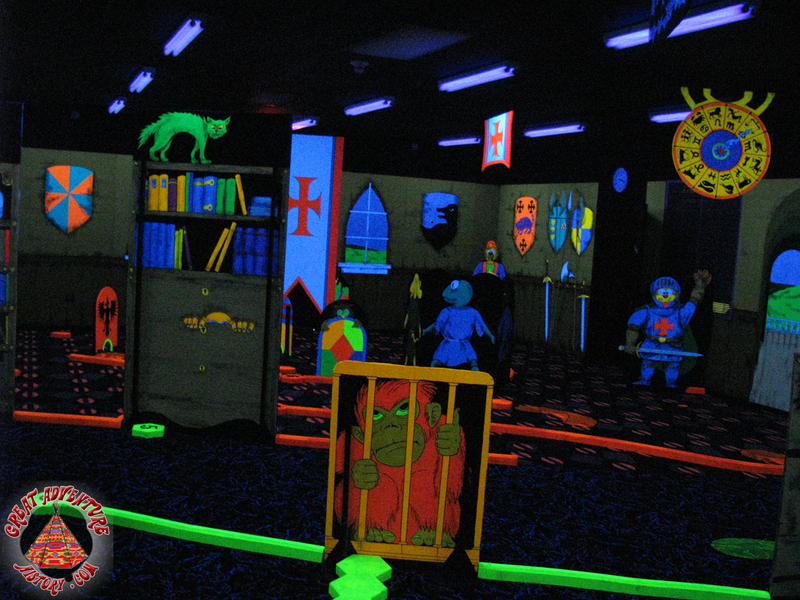 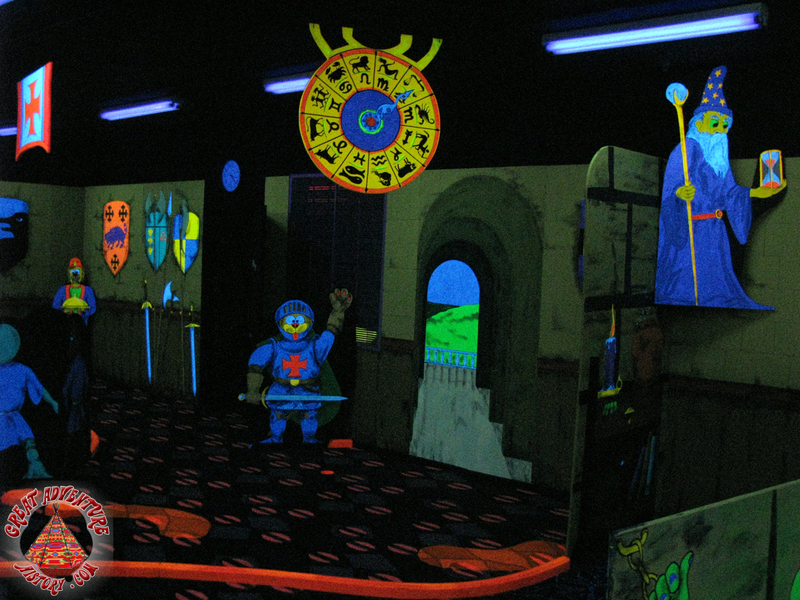 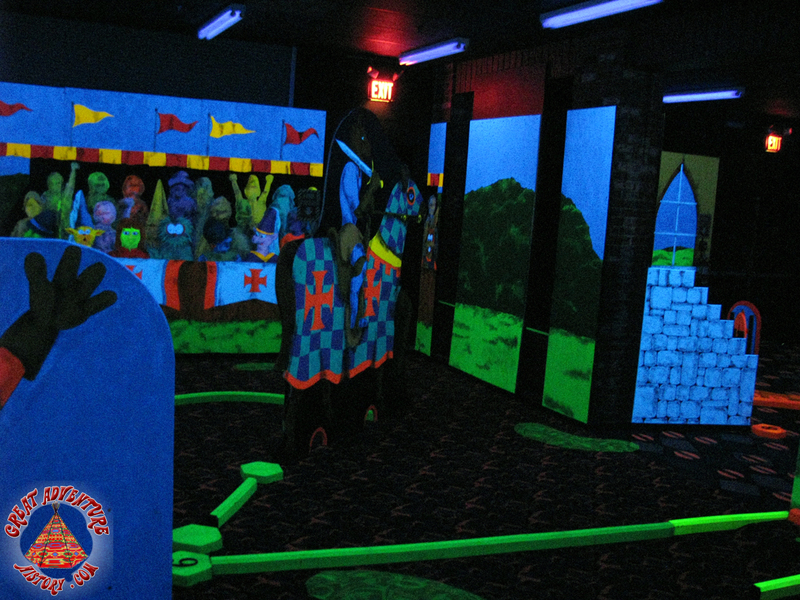 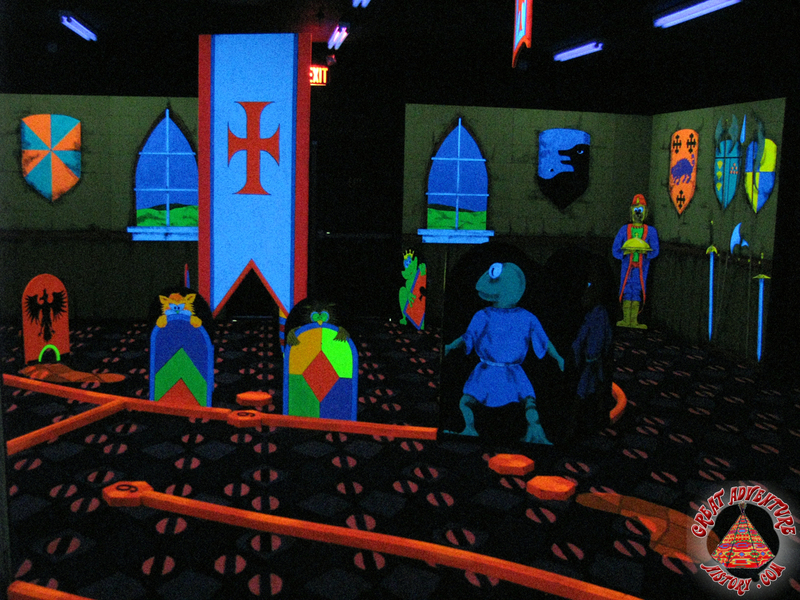 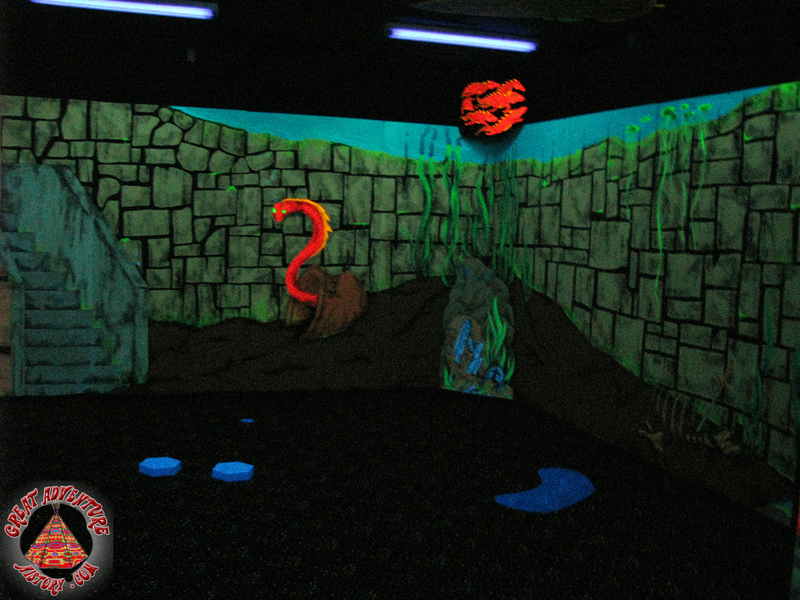 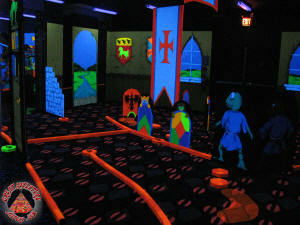 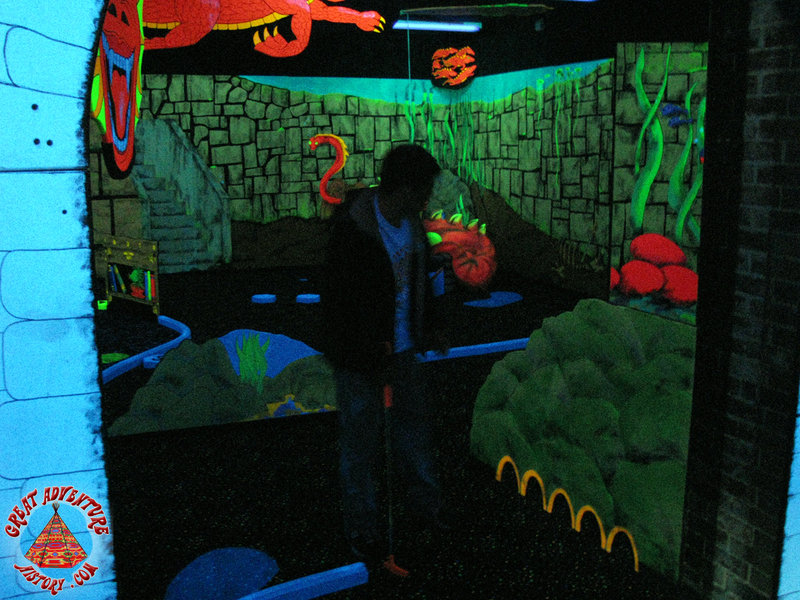 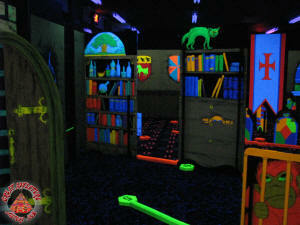 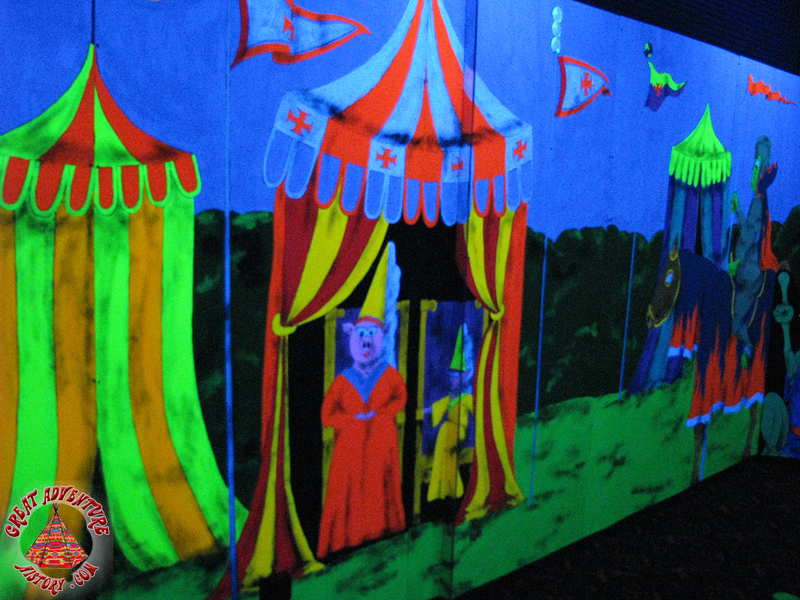 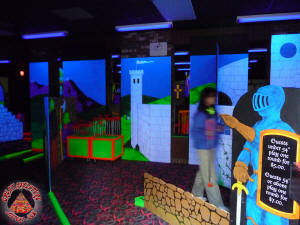 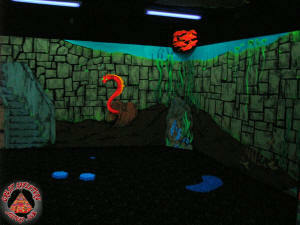 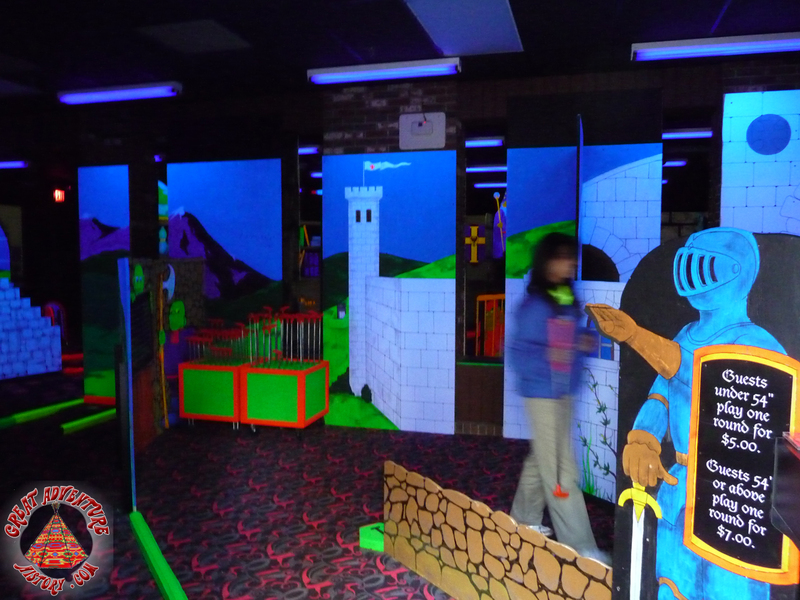 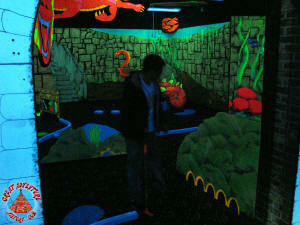 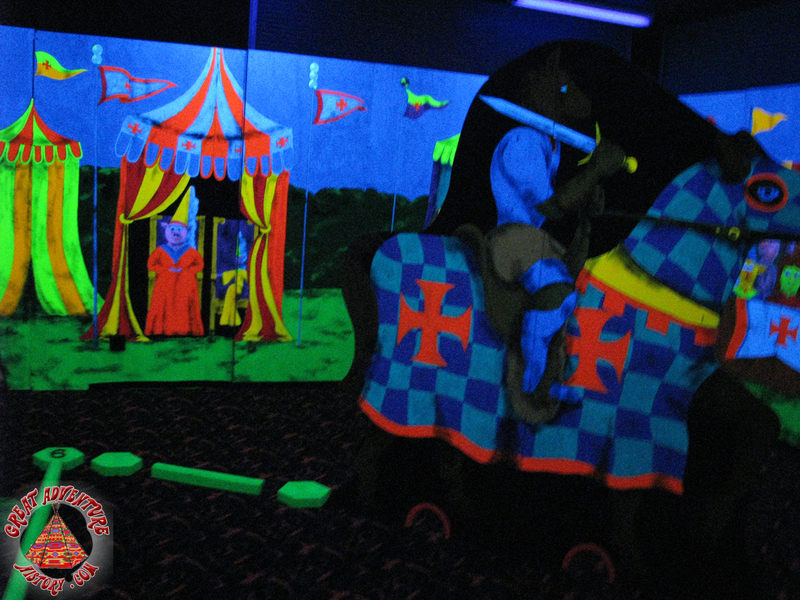 The interior was fitted with nine holes of mini-golf complete with 2-D and 3-D blacklight props. 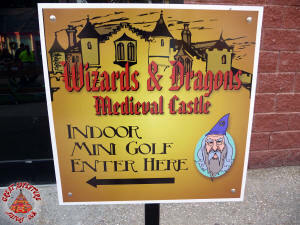 The medieval themed decor featured dragons and wizards as advertised, along with knights, tournaments, ogres and frogs all in a gothic castle type setting. 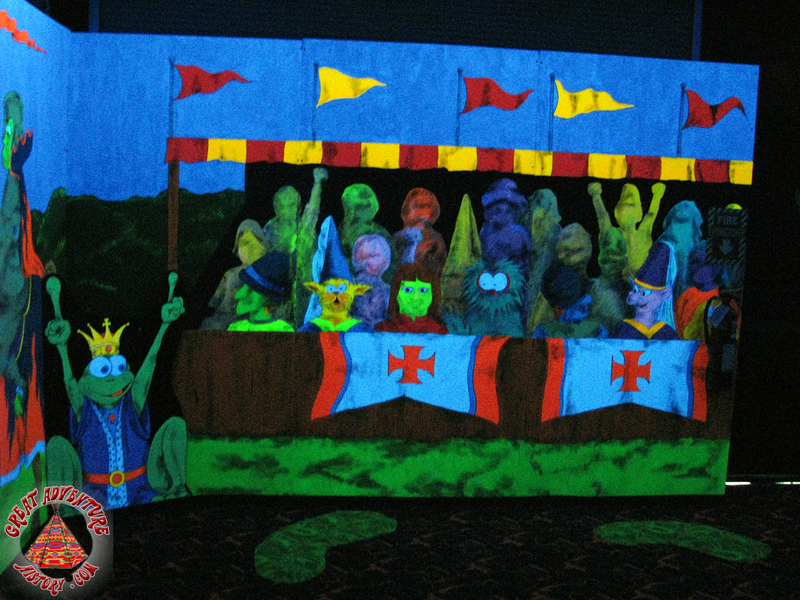 The props ran the gamut from simple cutouts painted with glow paint to fairly elaborate sculpted figures. 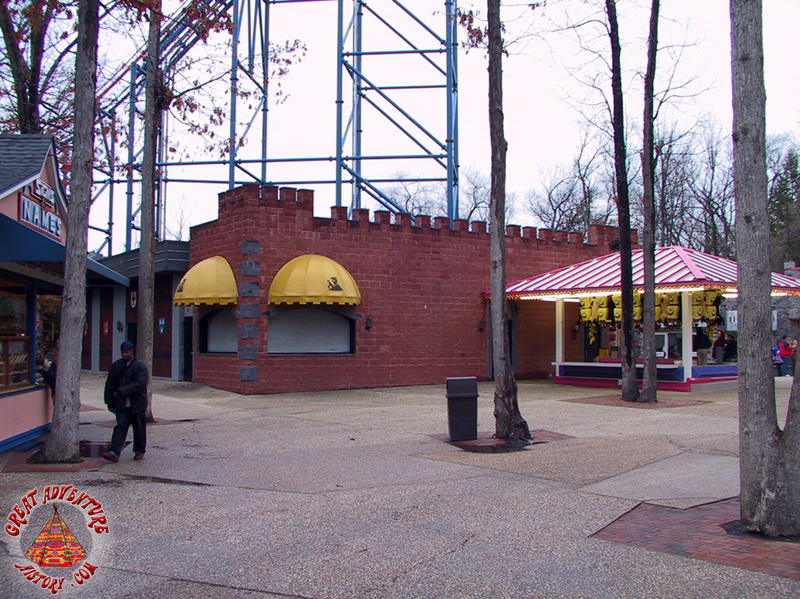 The 2010 season saw yet another makeover for the building with some major remodeling being done as it became home to two new attractions. 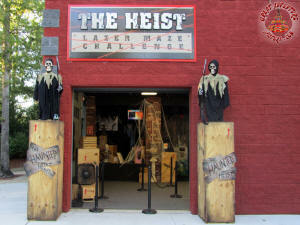 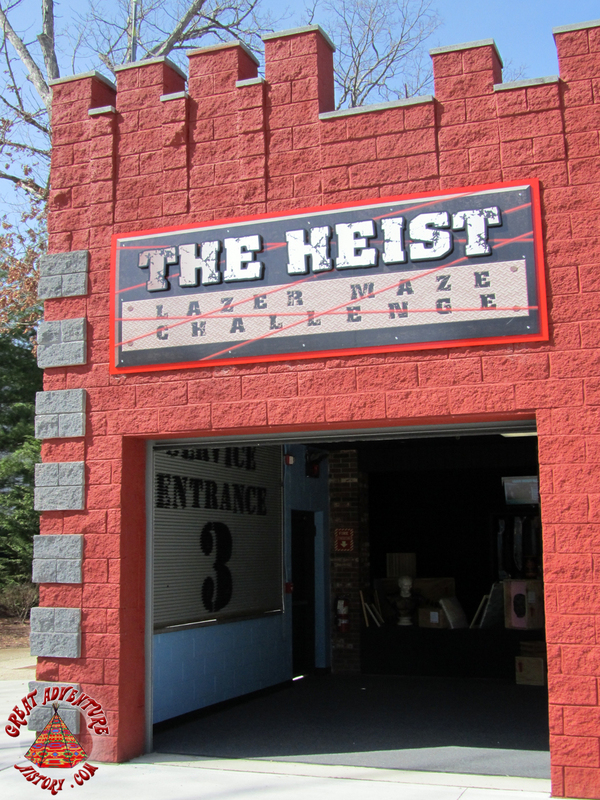 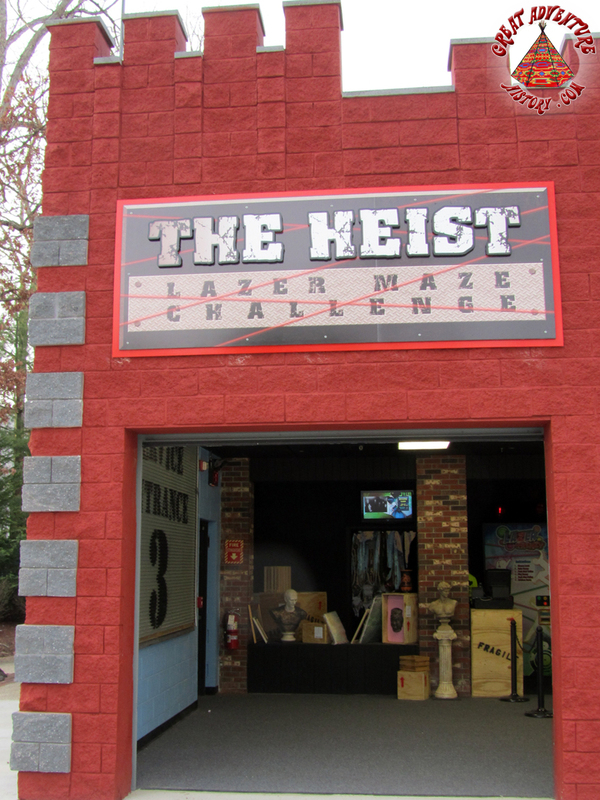 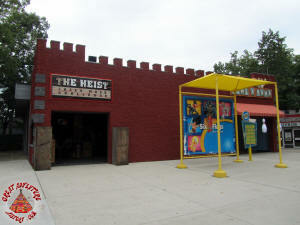 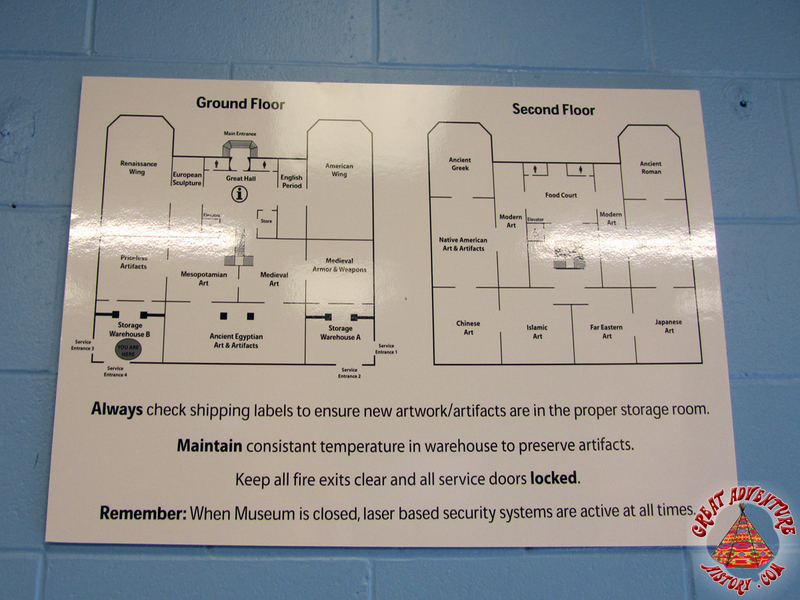 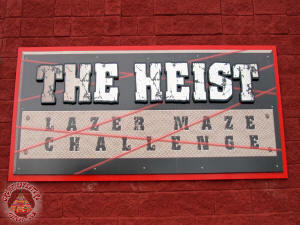 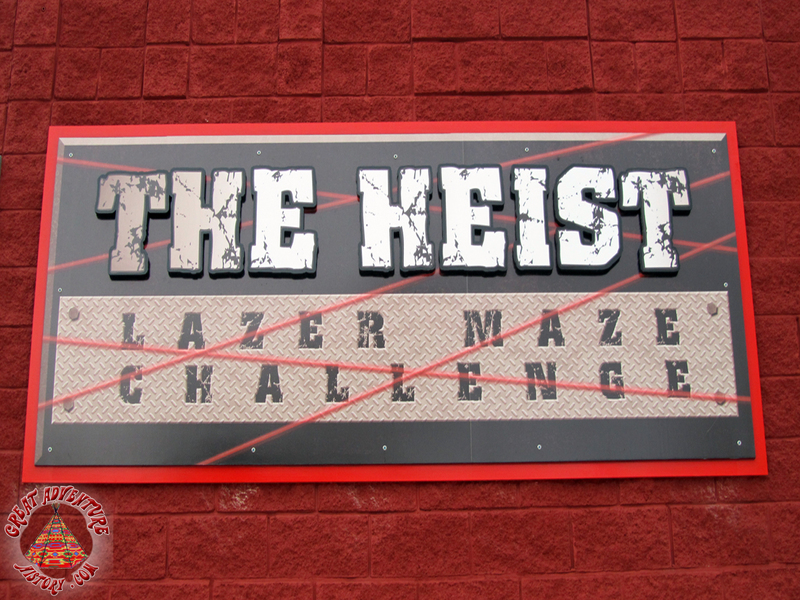 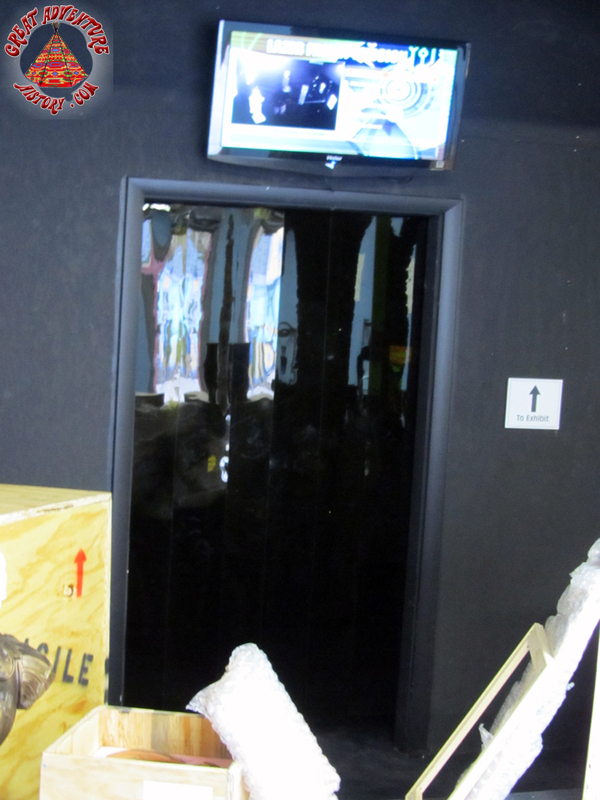 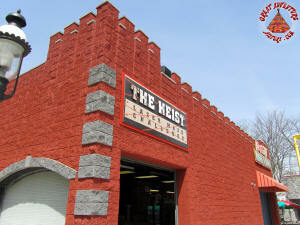 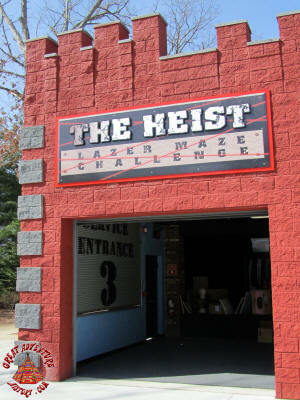 The Heist took over half the building, challenging guests to navigate a lazer maze to retrieve "artifacts". 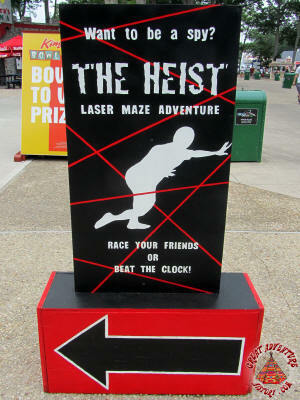 The object was to complete the task in the shortest time possible to try and beat friends and other guests shortest times. 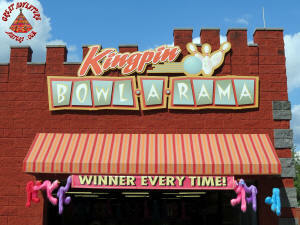 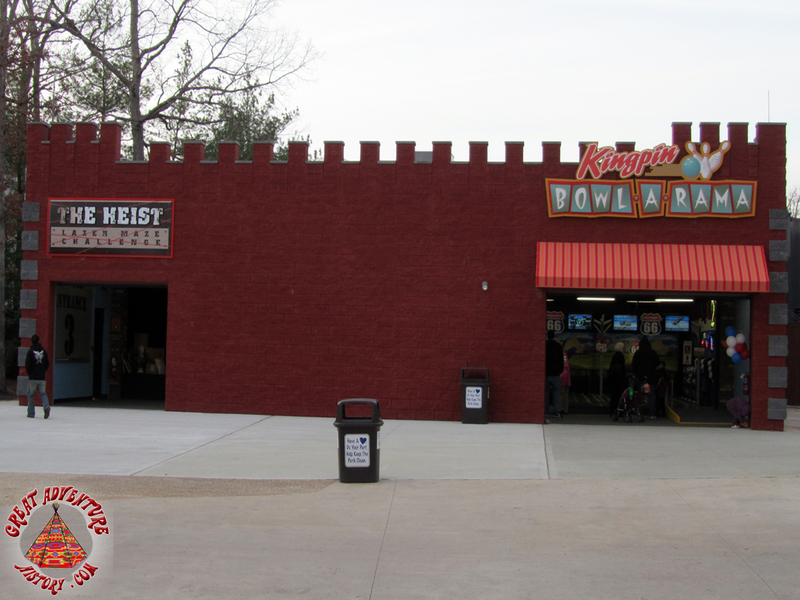 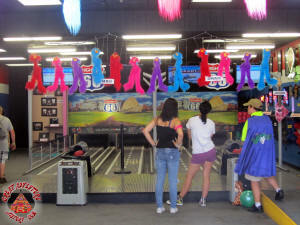 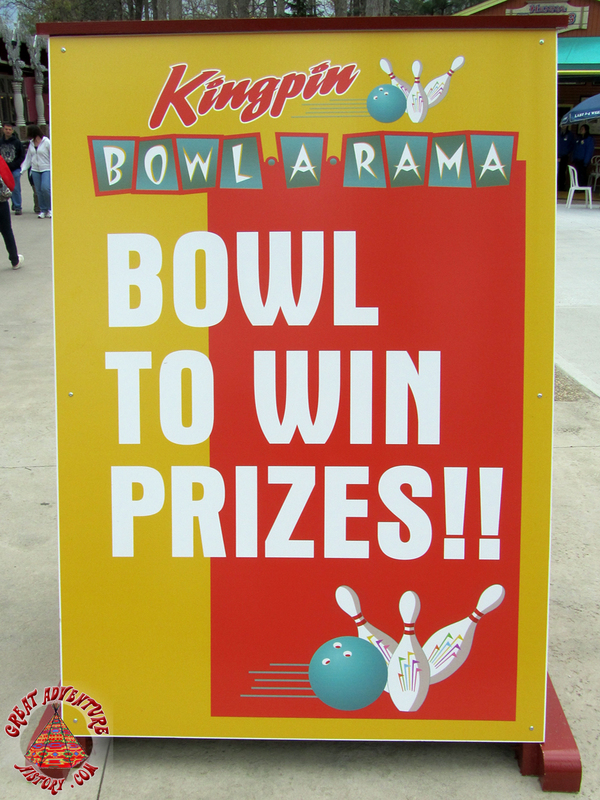 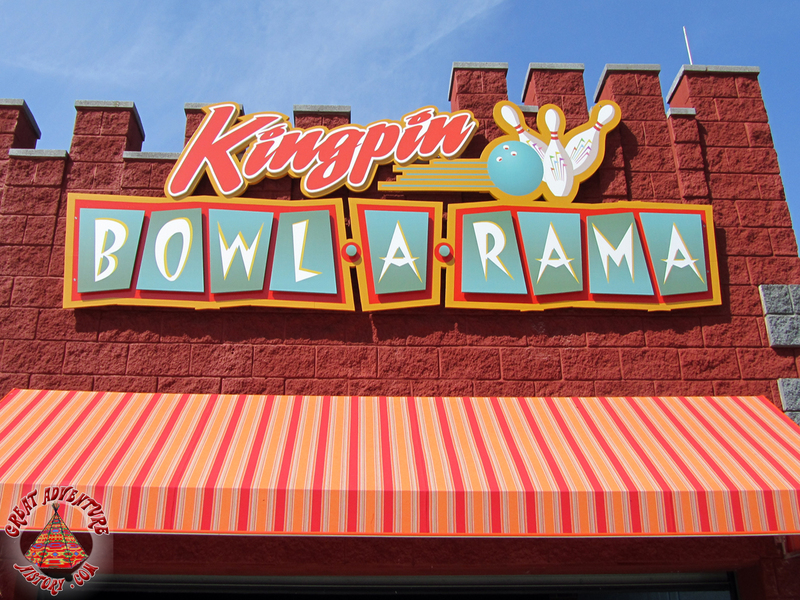 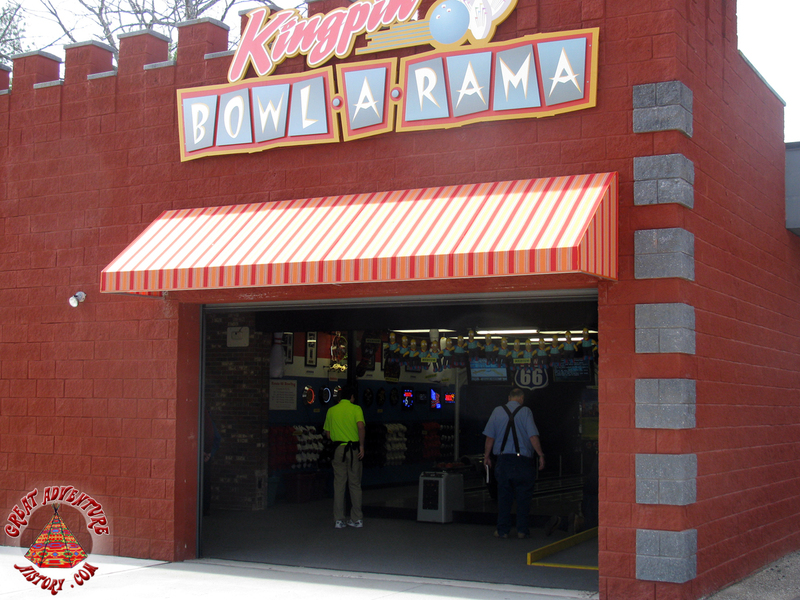 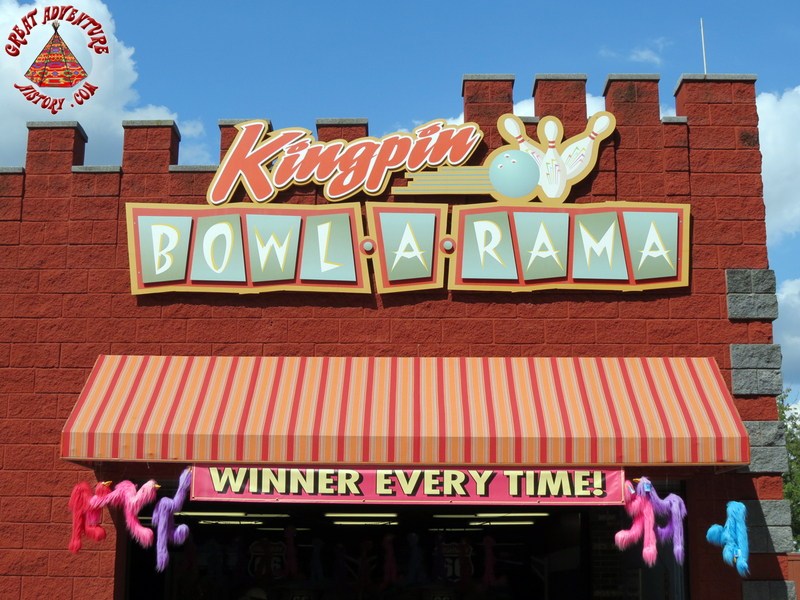 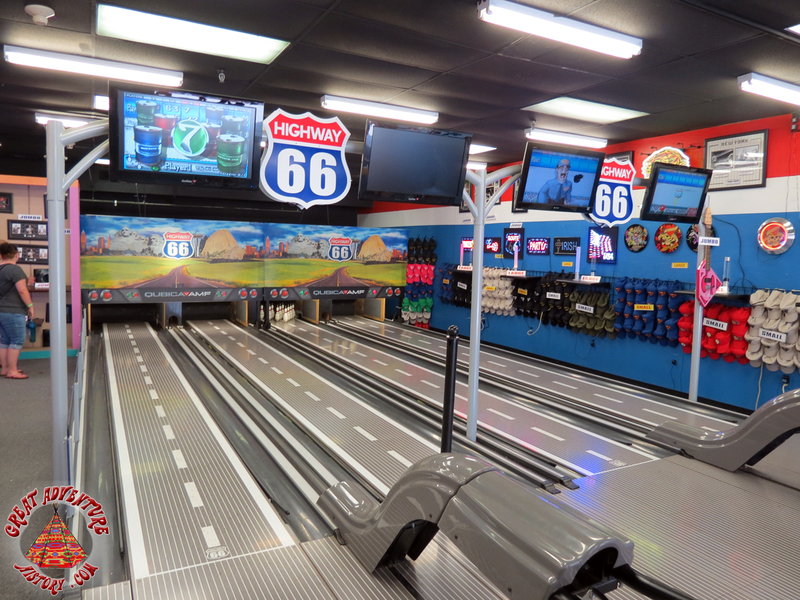 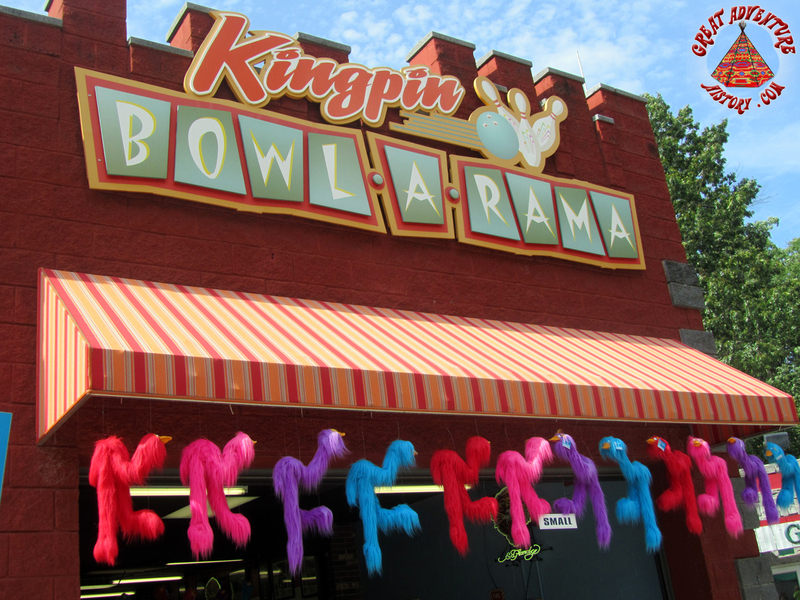 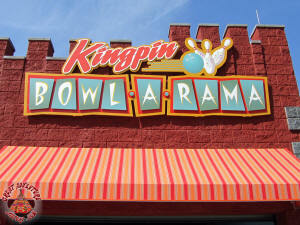 The other side of the building became home to the new Kingpin Bowl-a-Rama game. 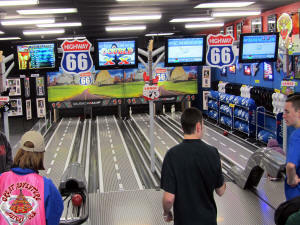 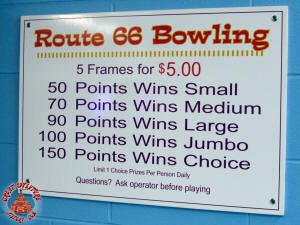 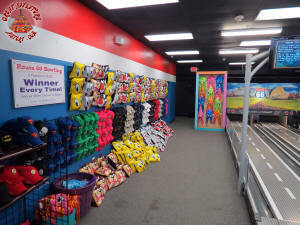 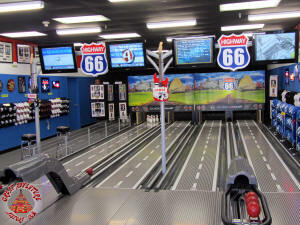 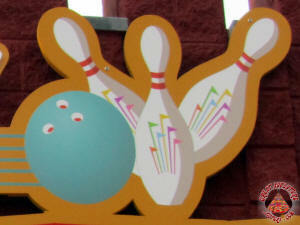 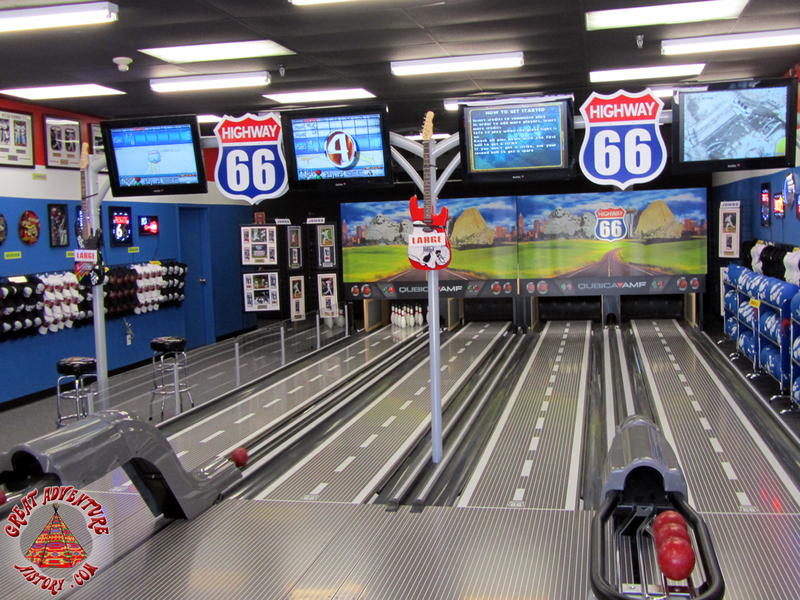 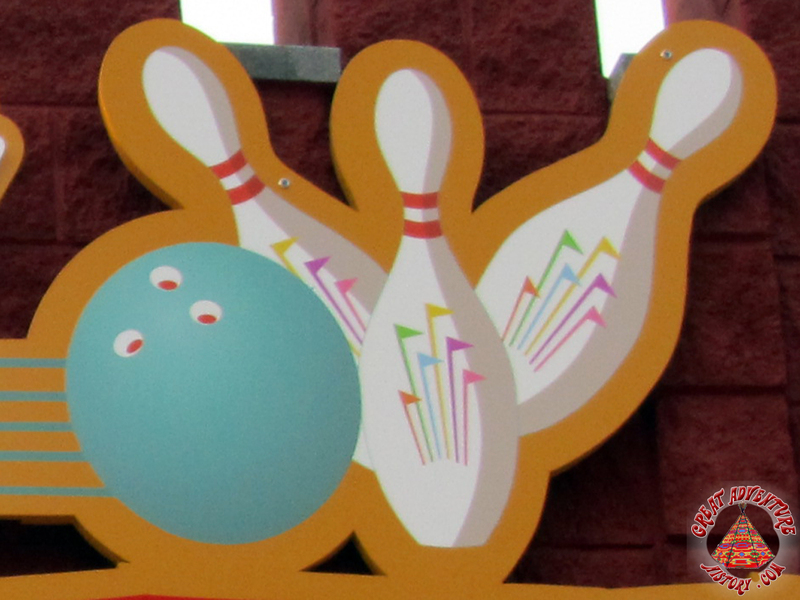 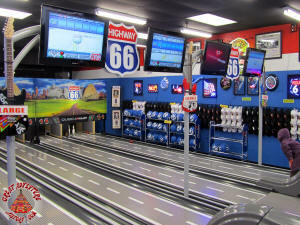 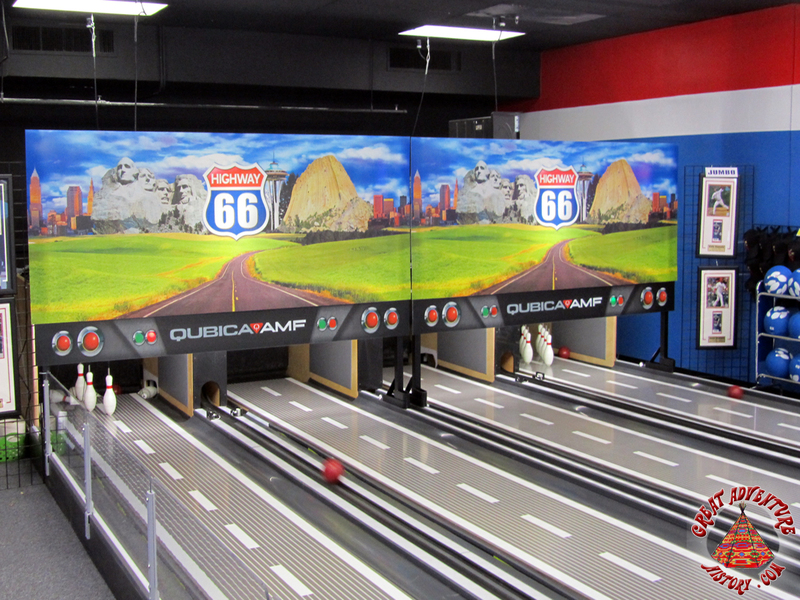 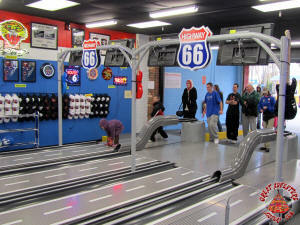 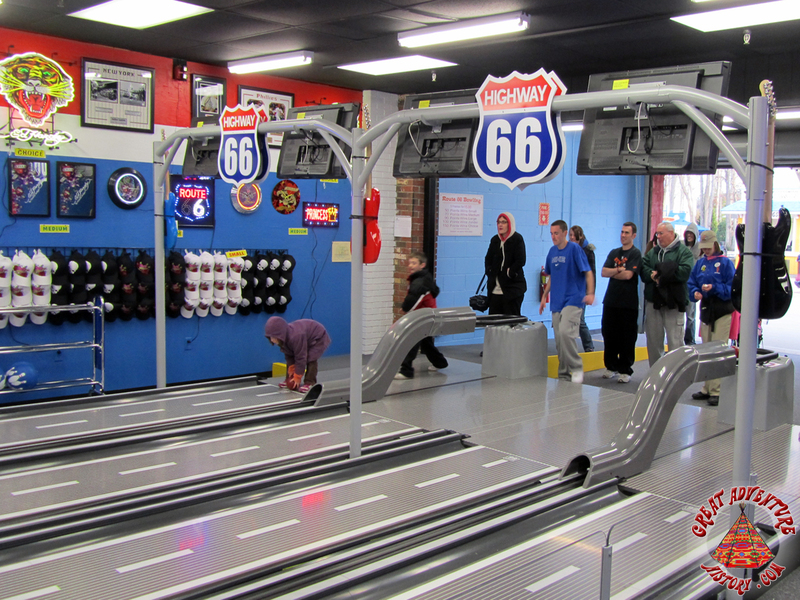 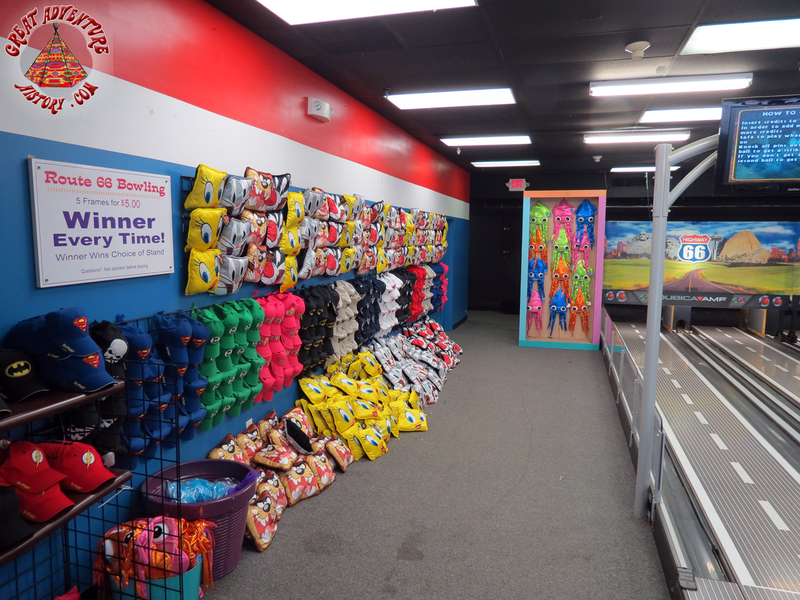 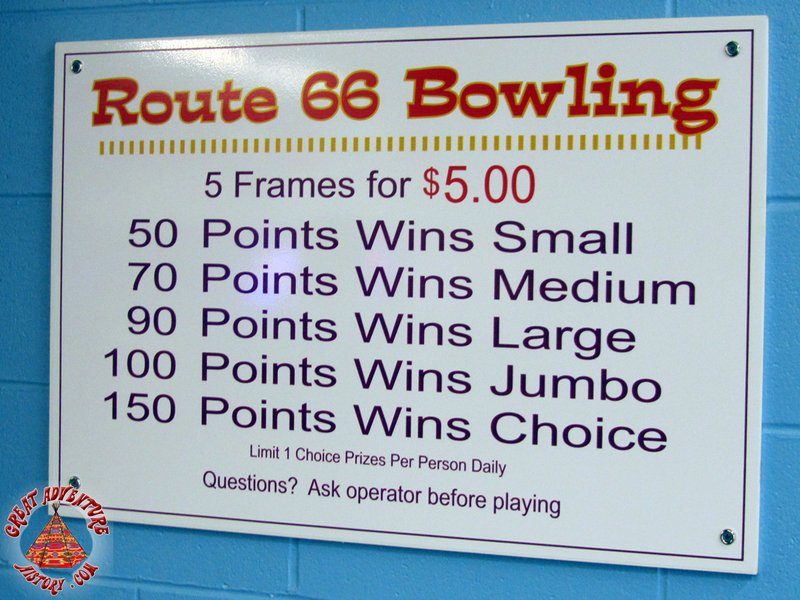 These mini bowling alleys offered guests a chance to play for prizes. The alleys had a Route 66 theme. For the 2011 season, the area in front of the building became home to one of the park's character meet and greet spots. 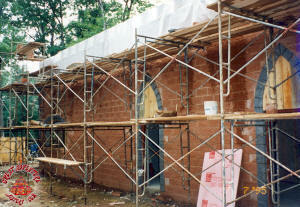 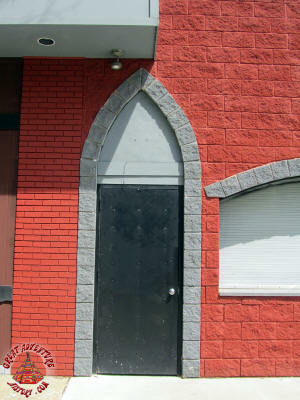 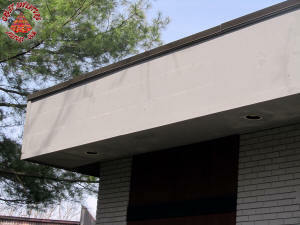 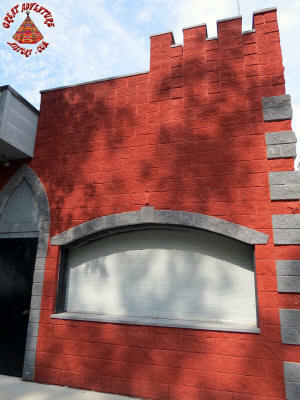 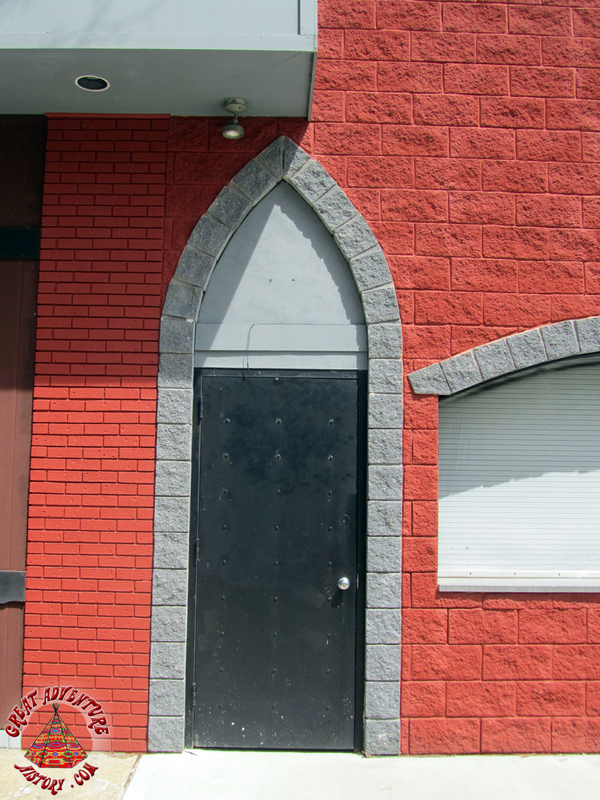 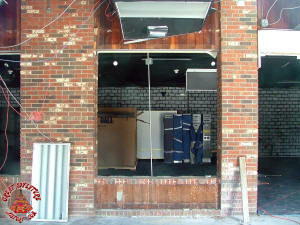 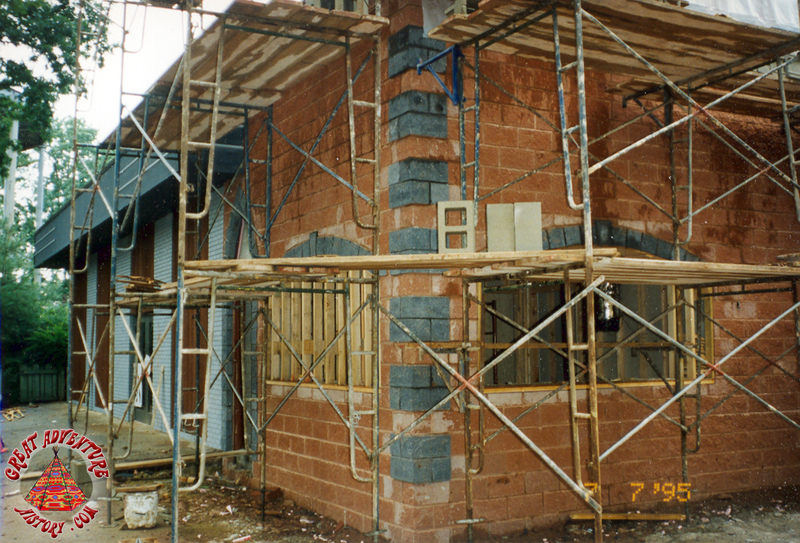 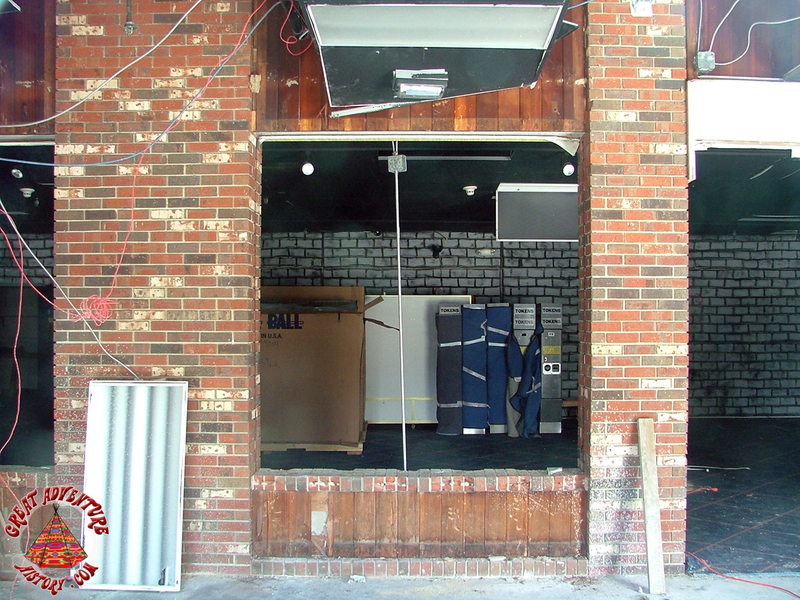 Over the seasons, the Pinball Parlor has had numerous modifications and the facade still sports evidence of many of these changes including different styles of brickwork and stonework. 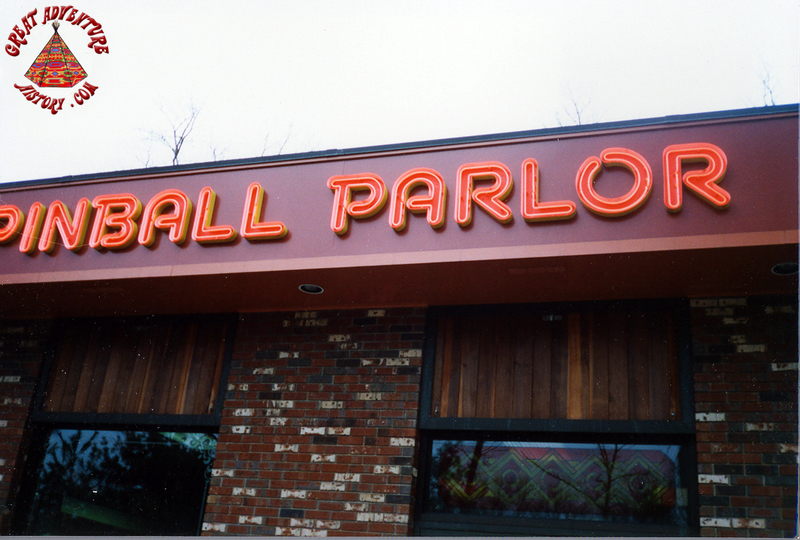 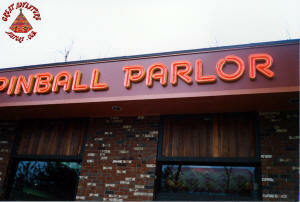 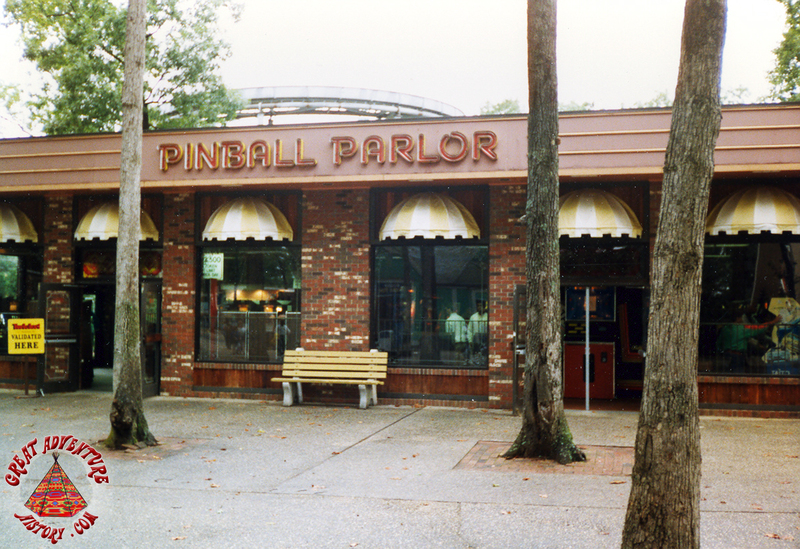 While one of the park's most basic structures, the Pinball Parlor has had a rich past serving guests as an arcade, maze, golf course, and bowling alley. Pinball may have been eliminated from Great Adventure decades ago, but the Pinball Parlor building still welcomes guest today.